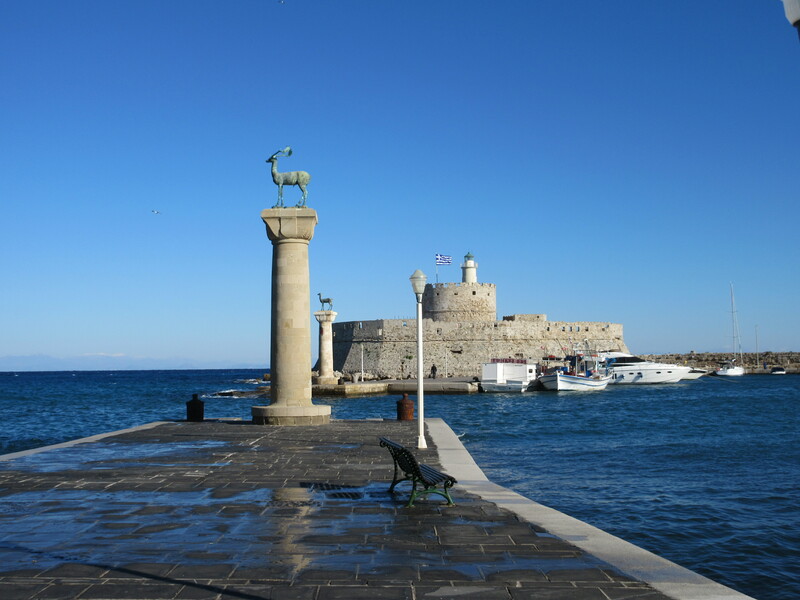 For the week of Christmas, we traveled by ferry over to the Greek island of Rhodes. Coming from the 99.9% Muslim Turkey, it was surprisingly sweet to hear Christmas carols in the grocery, to watch twinkling lights, and to see people wearing reindeer headbands and Santa hats. Similar to our experience in Turkey, Rhodes is in off-season mode with the tourist traps shut down and locals running all over the place. 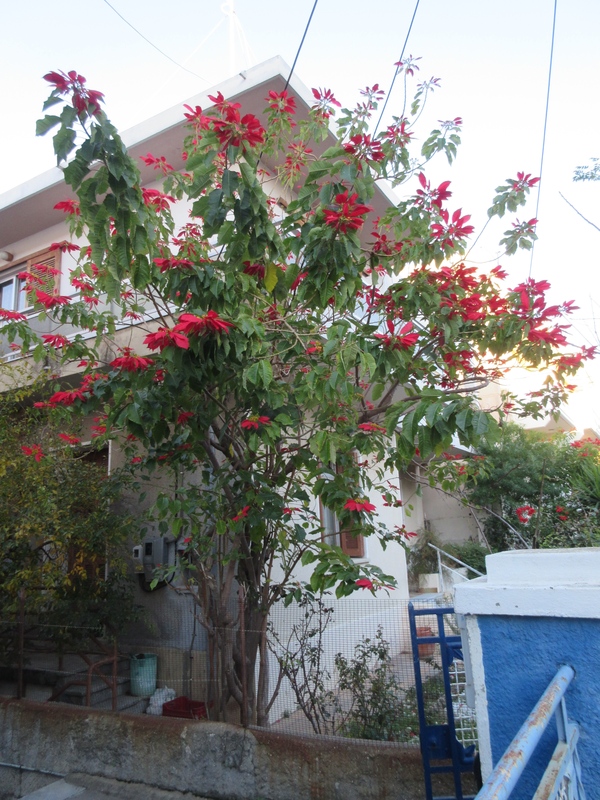 Poinsettia trees blooming in time for Christmas. Beside obviously being neighbors, Turkey and Greece share quite a history. In ancient times people moved back and forth, with many ancient Greek cities built in what is now Turkey. After the Greco-Turkish war ended, a population exchange took place in 1923. The idea was to concentrate all Muslims on Turkish soil and all Christians on Greek soil. It is estimated some two million people were forced from their homes and made refugees. 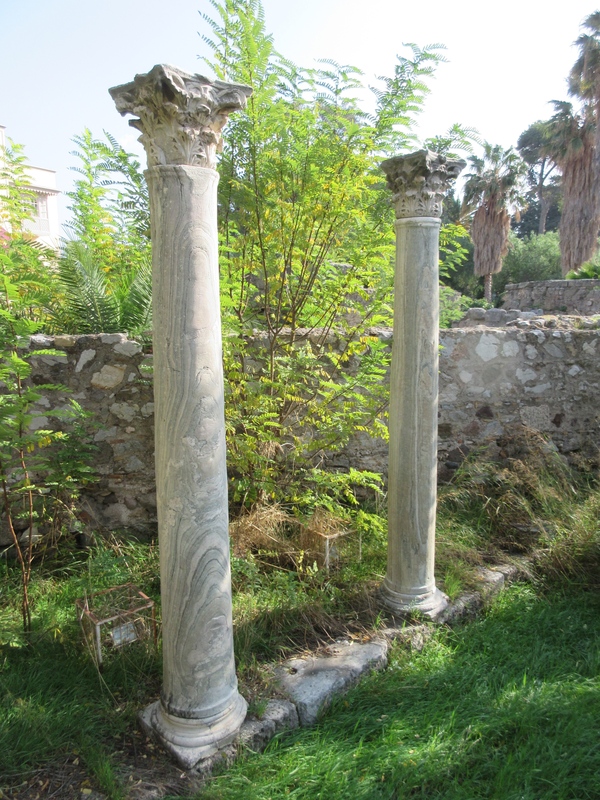 Hellenistic marble columns in ancient Agora on Kos. On the way to and from Rhodes we stopped on the island of Kos. 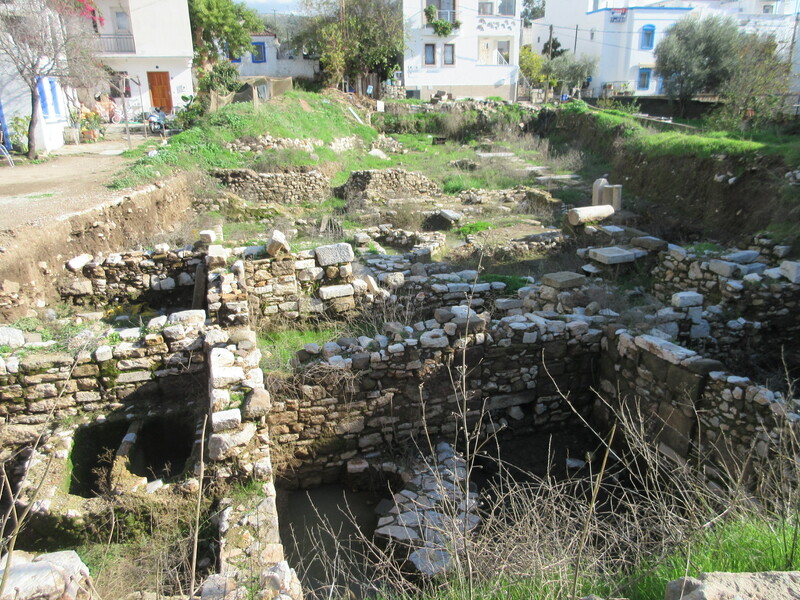 Right in town are very well laid out Hellinistic, Roman, and medieval buildings and ruins. 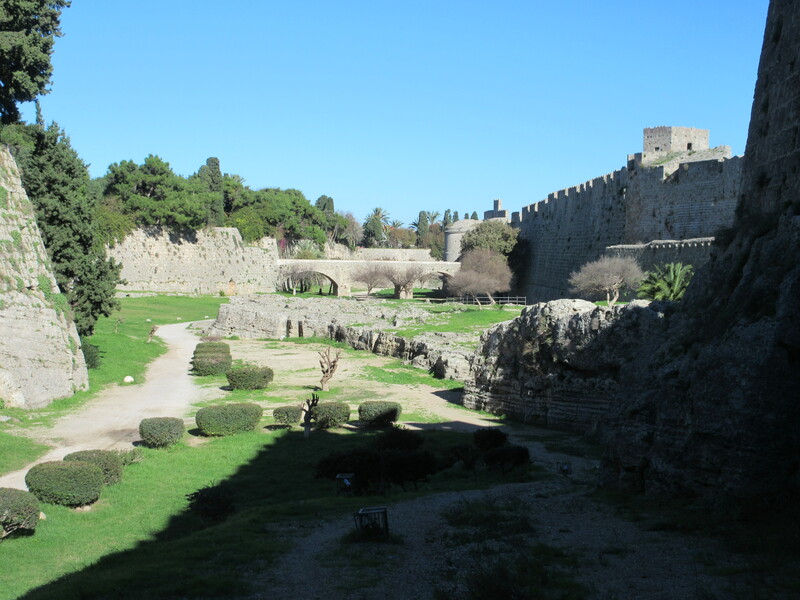 We wandered through the agora, looked at mosaic floors and marble columns, explored the Crusaders castle, and walked the docks at the marina between ferries. 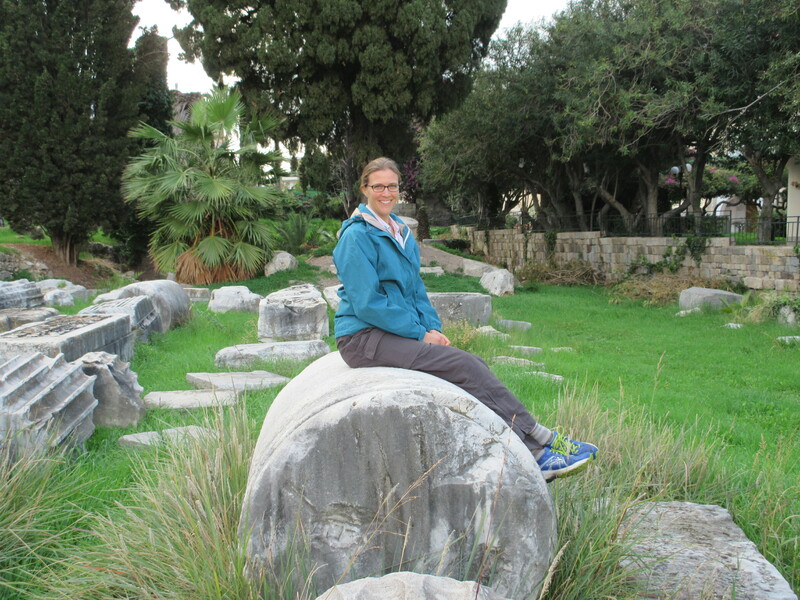 Outside the town of Kos is the Asclepeion where Hippocrates first practiced medicine. 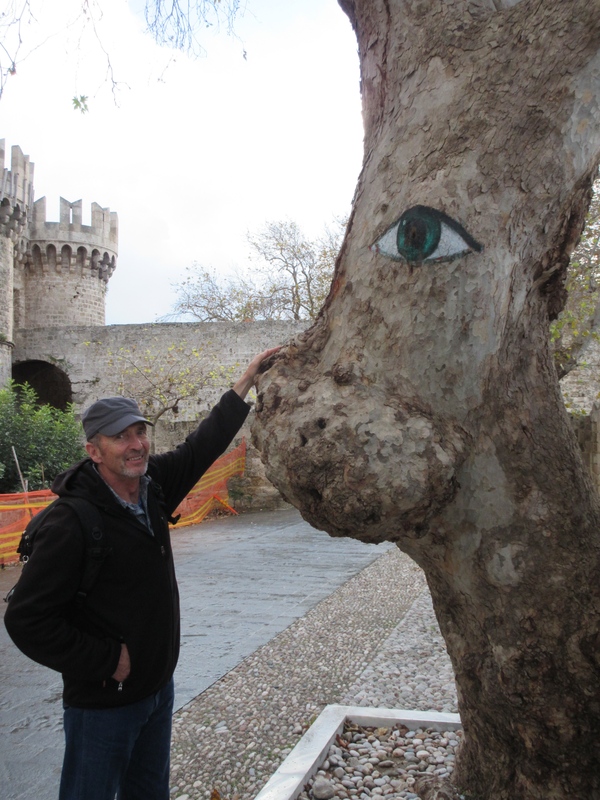 In Kos town, we spent a few minutes under the tree where legend has it that Hippocrates taught his students the art of medicine. 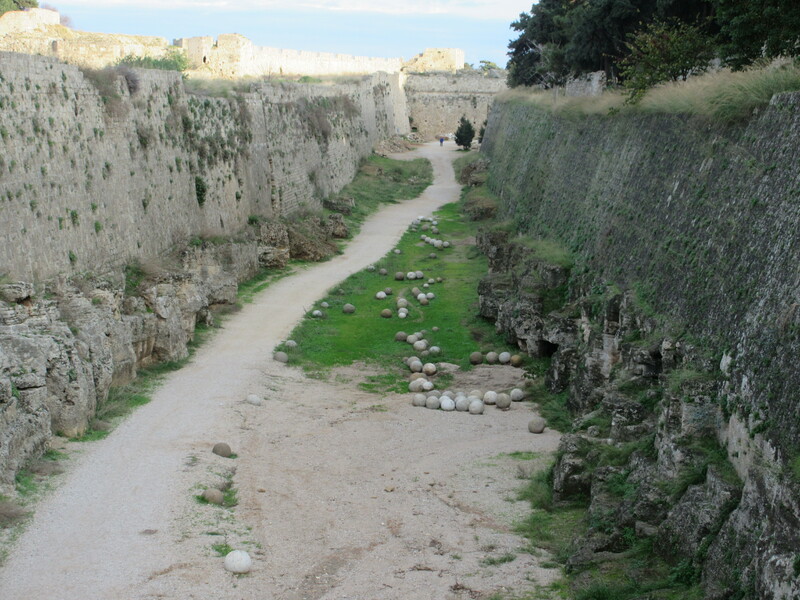 The moat around Rhodes. Today it is a frequent walking and jogging path. 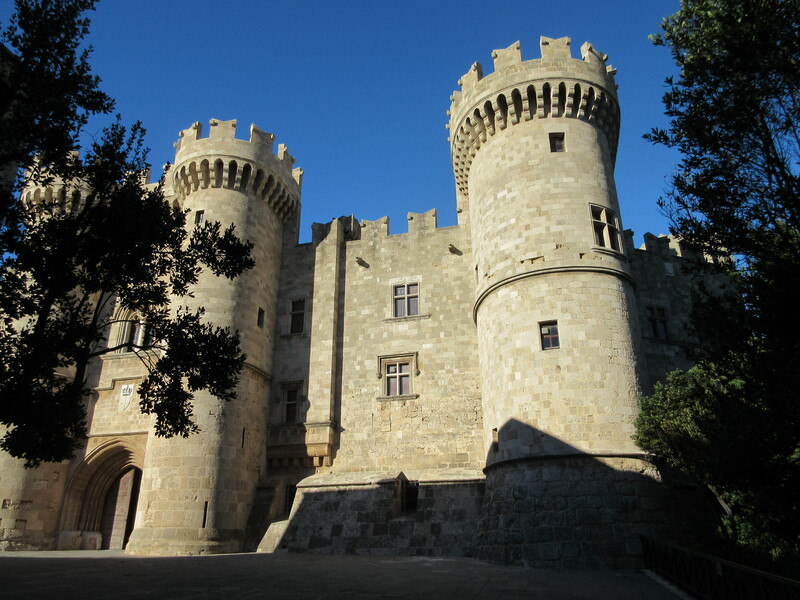 Rhodes is a UNESCO world heritage site. The medieval walled city is very large and in good shape. Apparently a few thousand people live inside the walls. Some business were still open but it was mostly closed up due to tourist season being over. We spent hours wandering the cobbled lanes, enjoying the bougainvillea and stonework. The Palace of the Grand Master is a central castle built by the St. John’s Knights within the walled city and today serves a museum. The beach from which we swam on Christmas Day, despite the grey clouds. 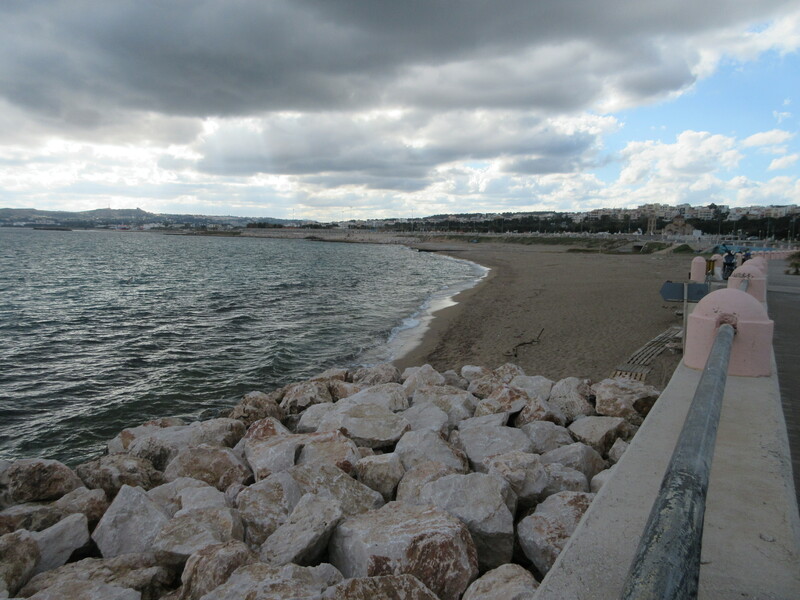 On Christmas Day, we swam in the Mediterranean. It was cold but not so cold we couldn’t spend about 20 minutes swimming around and making bubbles. Nor were we the only ones in the water. All the beaches in Rhodes appear to be set up for year-round swimmers with changing stalls, benches, hooks, and fresh-water showers. Luckily, the black hose leading to the shower provided warm water despite the overcast day. Even on a day when we felt frozen by strong wind, the distant Turkish mountains were capped in fresh snow, and the waves were a meter high, there were people swimming in the sea! 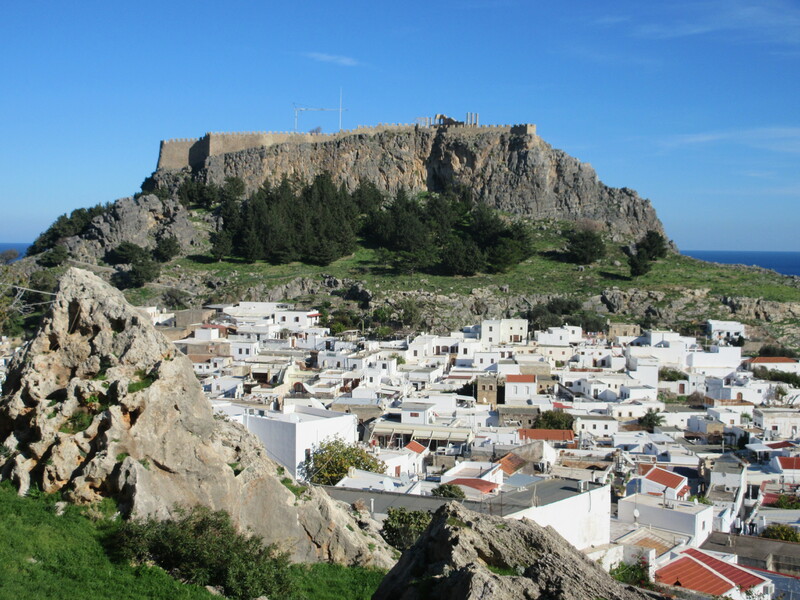 Lindos town and the fortified acropolis. 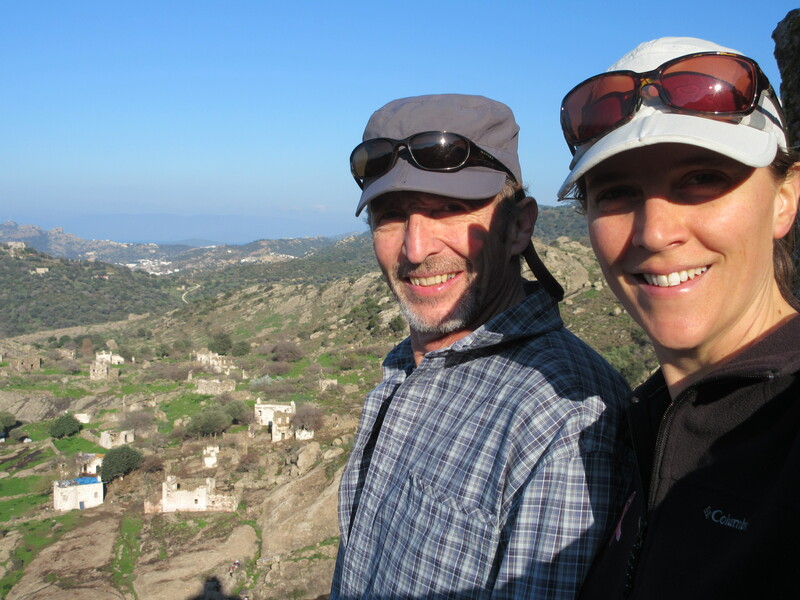 One day we took the public bus down to the town of Lindos. An elaborate temple to Athena sat on the steep hill above town, with construction completed about 300 BC. Later, the Greeks, Romans, and Byzantines added to the hill-top sanctuary. 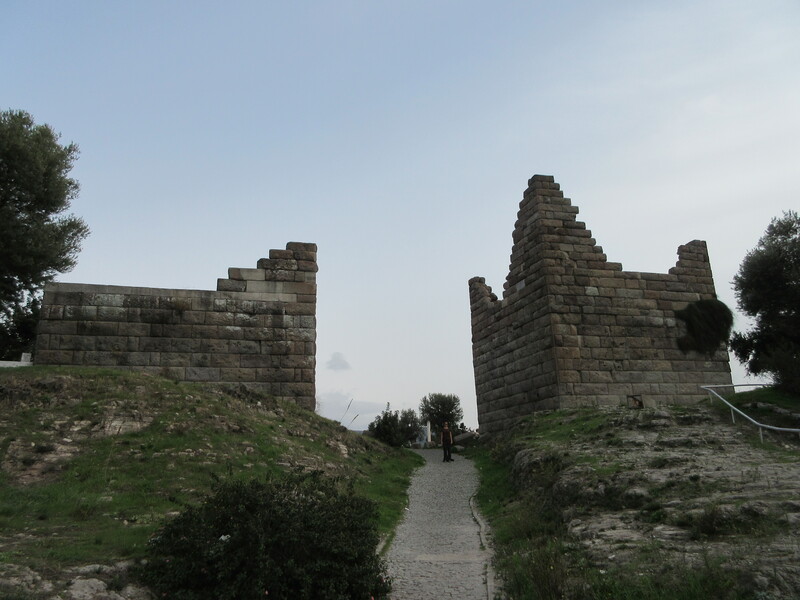 Later still, the Crusaders and then Ottomans turned it into a fortress. The modern-day town of Lindos is one of the most picturesque things you can imagine, but was seemingly vacant. One restaurant and one small mini-market were open, all else was shuttered for the season. It was full of beautiful white homes closed up. Entrance to the Temple to Athena above Lindos. A few months ago we heard about a documentary called The Venice Syndrome. Apparently, Venice has as many residents today as it did after the Great Plague in 1438. The cost of living is so high, the city has become uninhabitable. Extreme tourist pressure means hundreds of locals leave every year. We wondered if perhaps the same is happening in Lindos. 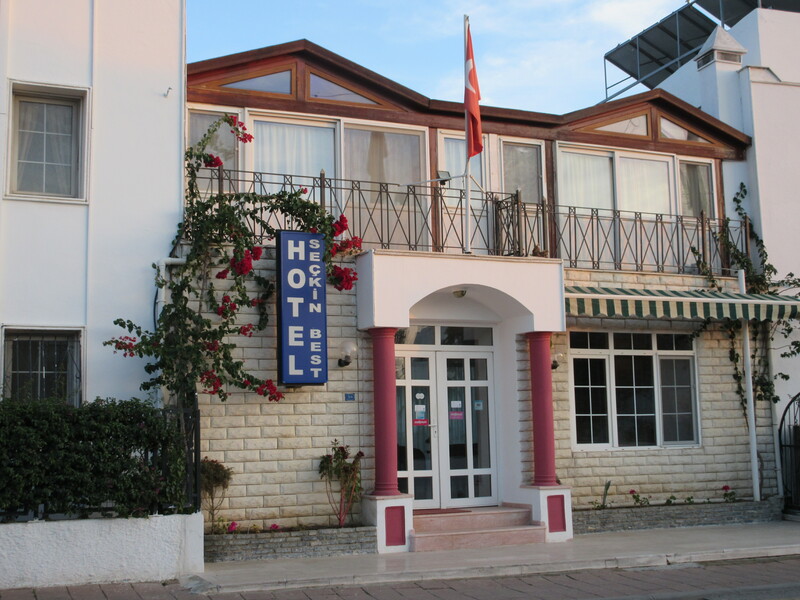 Nearly every building had an English sign up for hotel, apartment, hostel, pension, or room—indications that they had converted these old stone homes to compact rental accommodation for tourists. What is the fate of locals here? Especially those on the low end of the economic scale? A taxi driver told us the year-round population of the island is 115,000 and it swells to half a million in the summer with tourists. Certainly, Greeks welcome tourist income but, at what cost? 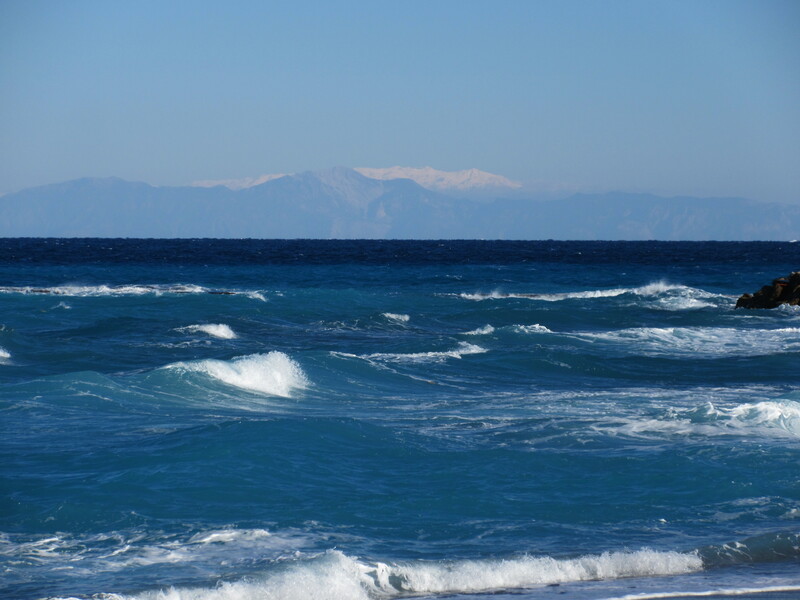 A stormy day at a Rhodes beach with snow on the Turkish mountains. See more pictures from Rhodes and Kos in the Greek Island photo album here. You can also check out where Rhodes is on the map. 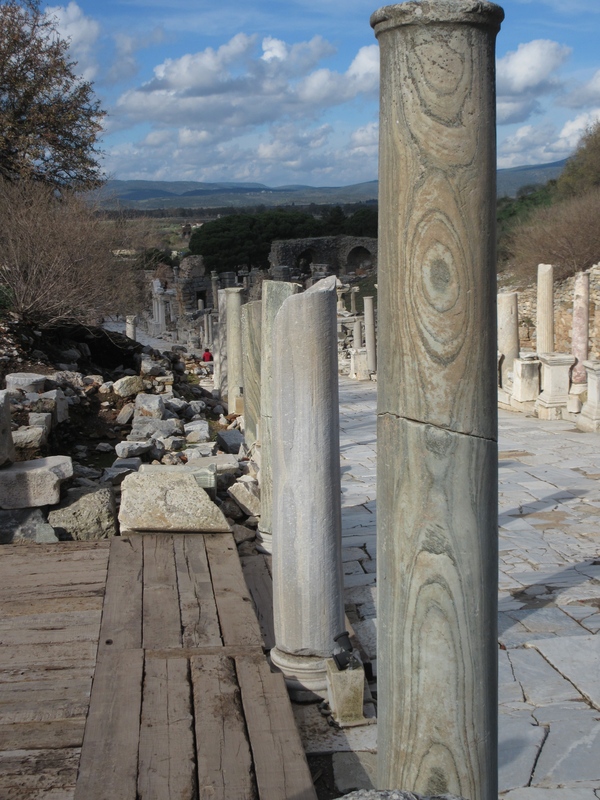 Many of the columns in ancient Agora were enormous. Megan’s rides side saddle on the one for scale. 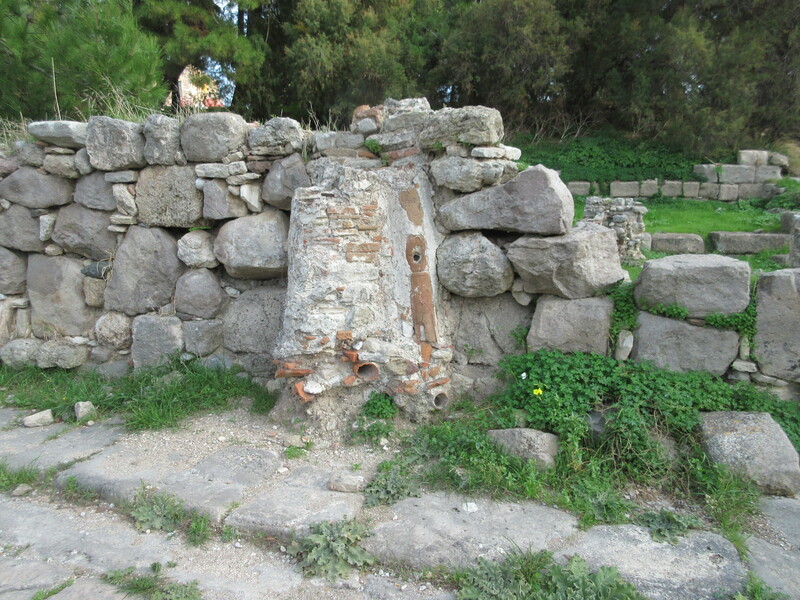 Ancient Roman Nymphaeum on Kos. 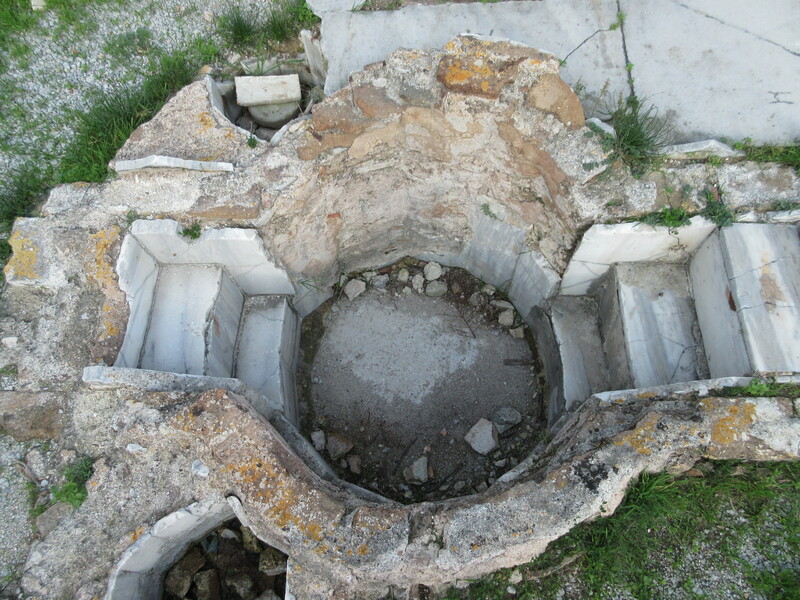 An ancient Roman hot tub on Kos. 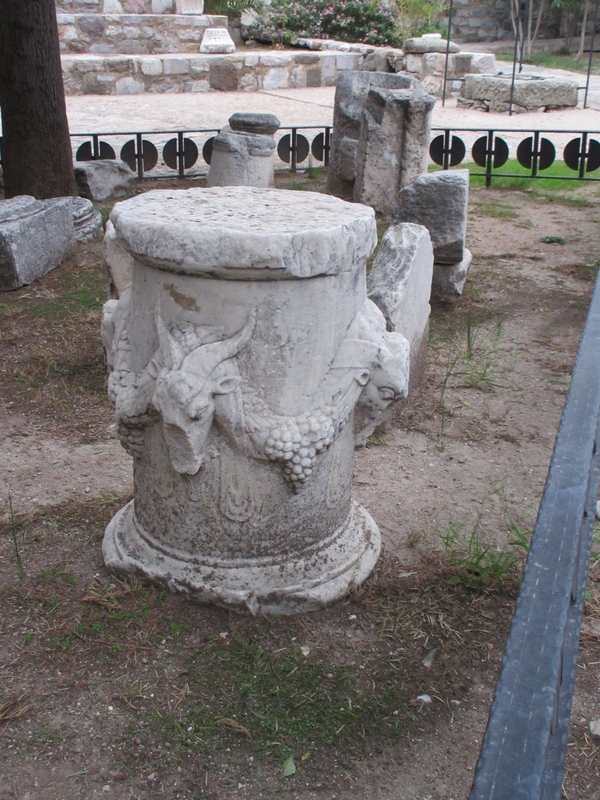 Pipe fragments from ancient Roman plumbing on Kos. 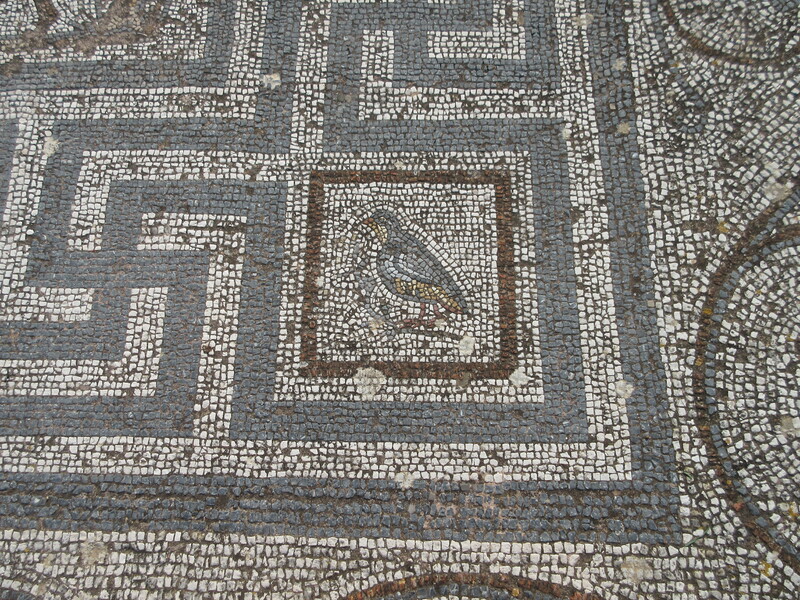 Even the Greeks “put a bird on it” in this mosaic floor. Ancient Agora on Kos. Early recycling. 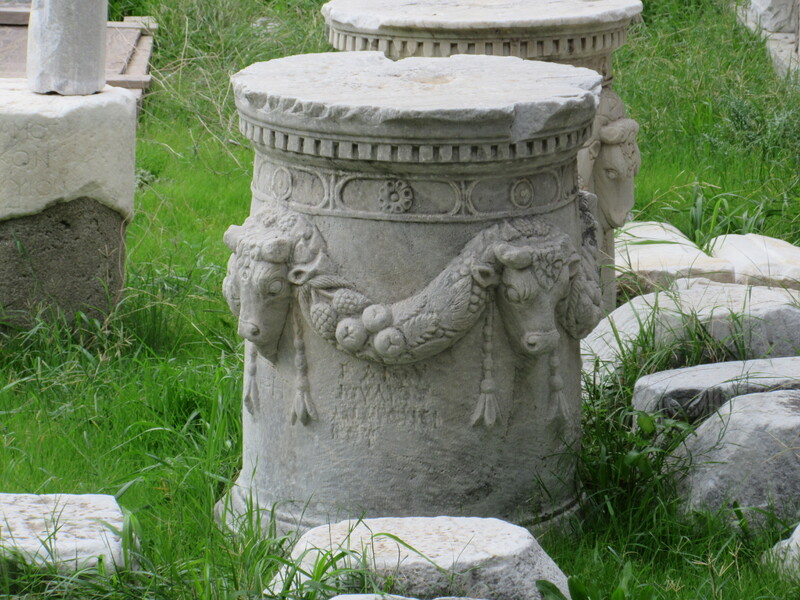 Thirteen gorgeous columns placed in their weakest position with this reuse. 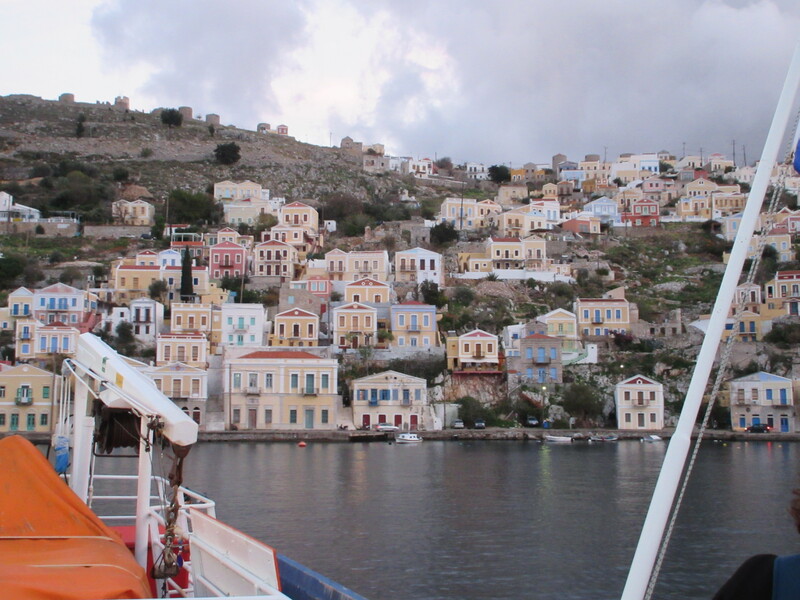 Symi, a picturesque Greek island as seen from the ferry. 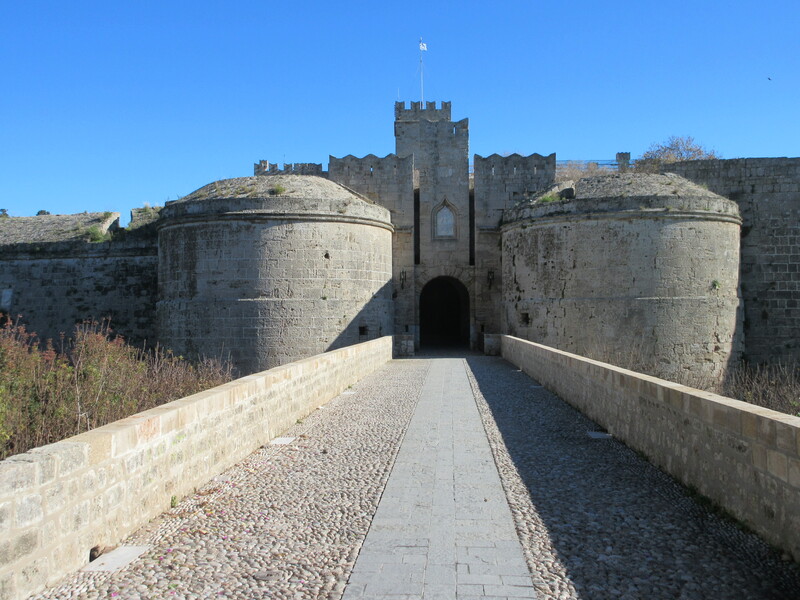 One of the entrances to the medieval walled city of Rhodes. This is the entrance to the old harbor on Rhodes. 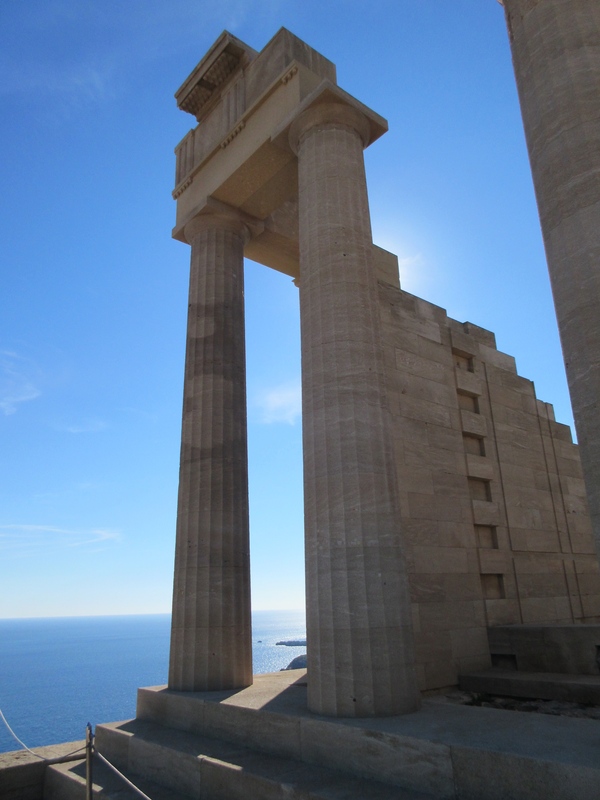 Legend has it that Helios stood with one leg on either side of the entrance as the Colossos of Rhodes, one of the Seven Wonders of the Ancient World. 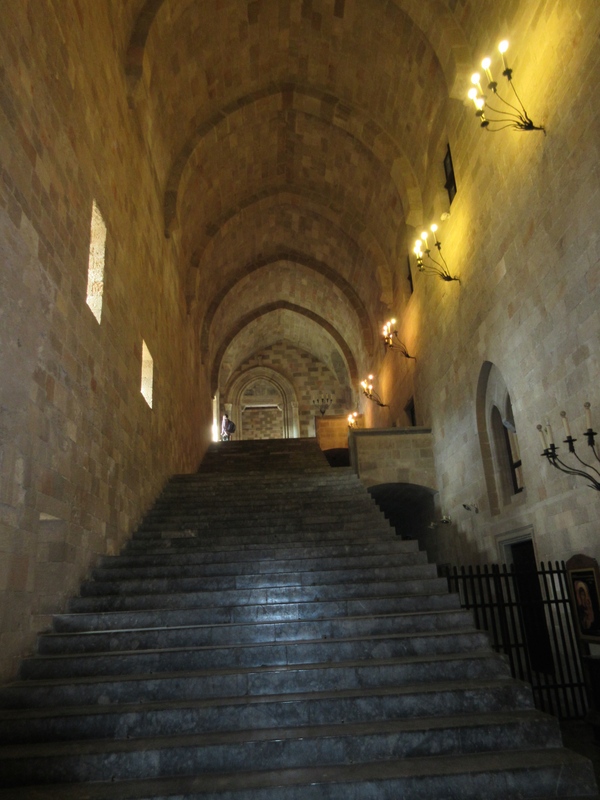 Inside the Palace of the Grand Master. 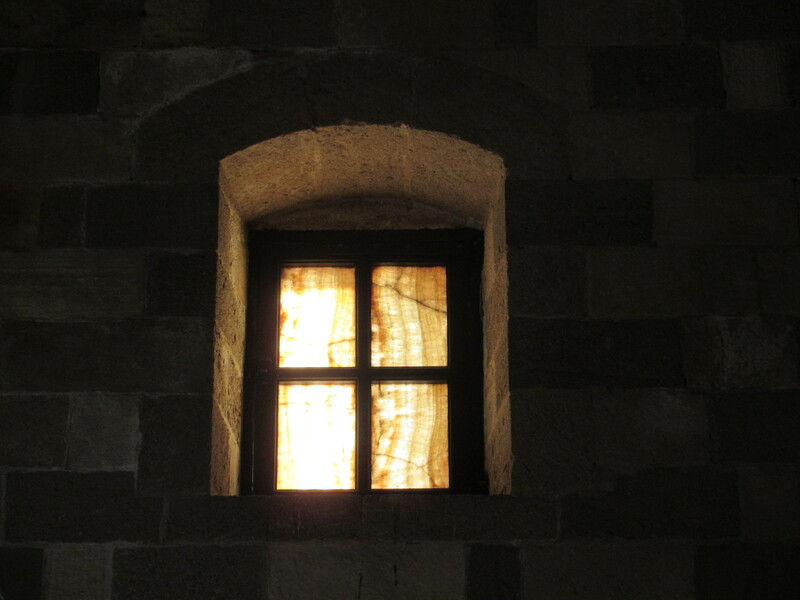 Many of the small windows in the Palace of the Grand Master are made from stone instead of glass. Megan among the columns above Lindos. 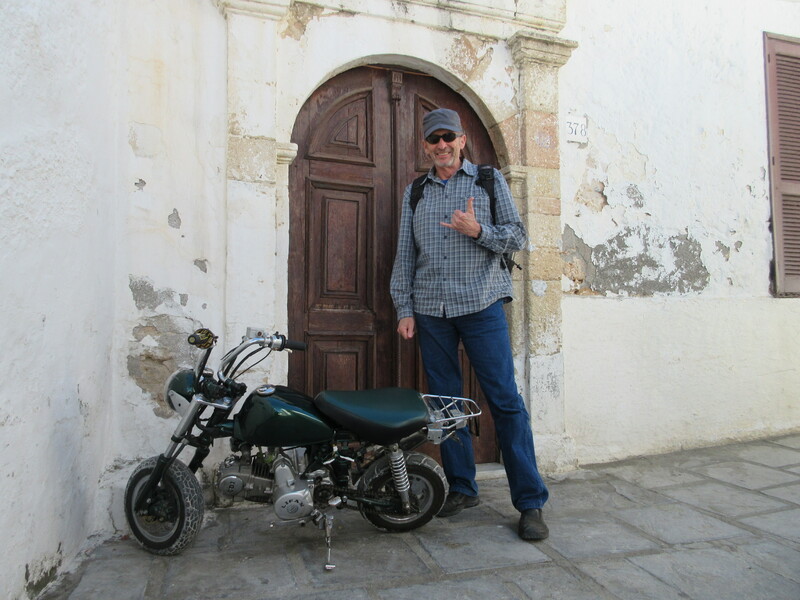 Bike for a very small man. 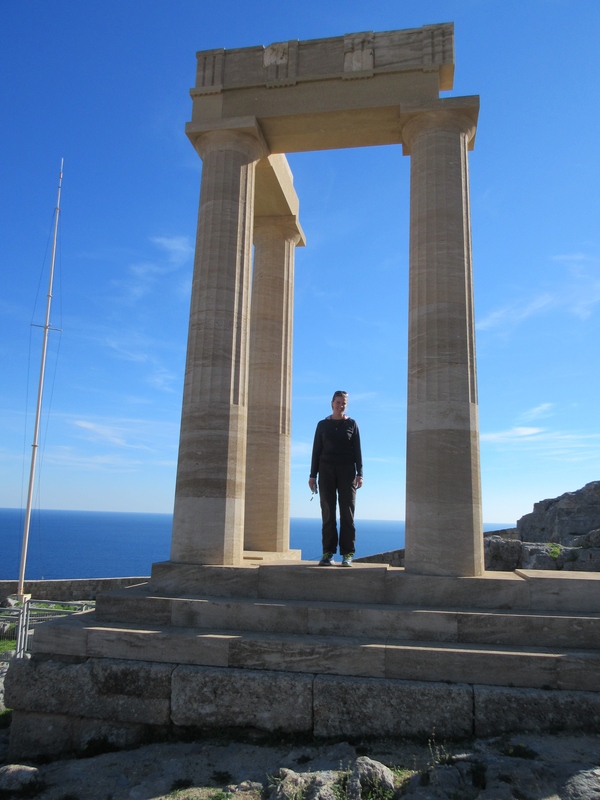 A Hellenistic funerary monument above Lindos. 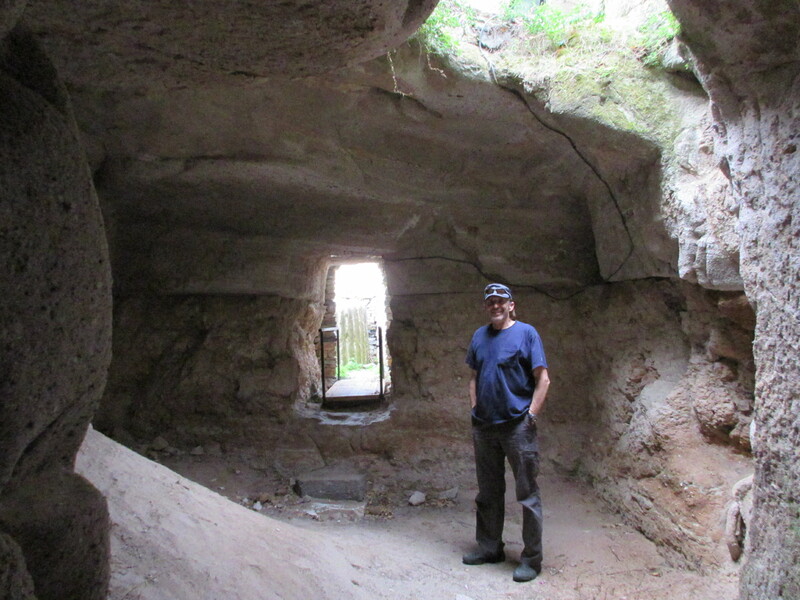 The rocks at the cave entrance were carved. Unfortunately the roof fell in long ago. 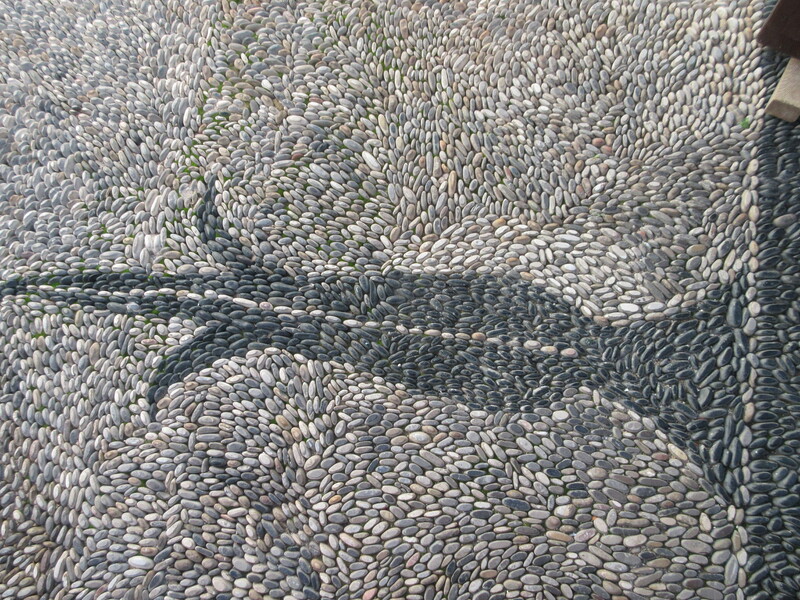 On the Greek islands we visited cobbles are made from river stones turned on their sides. If you look closely, you can see many of these stones are worn flat on the upper edge. The Rhodes moat. These granite balls were fired from mortars short-range out of the moat at encroaching attackers. Olive trees get pruned for decades to keep all the limbs in easy reach. Over time, you get fat gnarled trunks on what look like small trees. Jim makes a new friend. Our ferry passed through this narrow gap at over 30 mph. The small speck on the right side is a fishing boat! 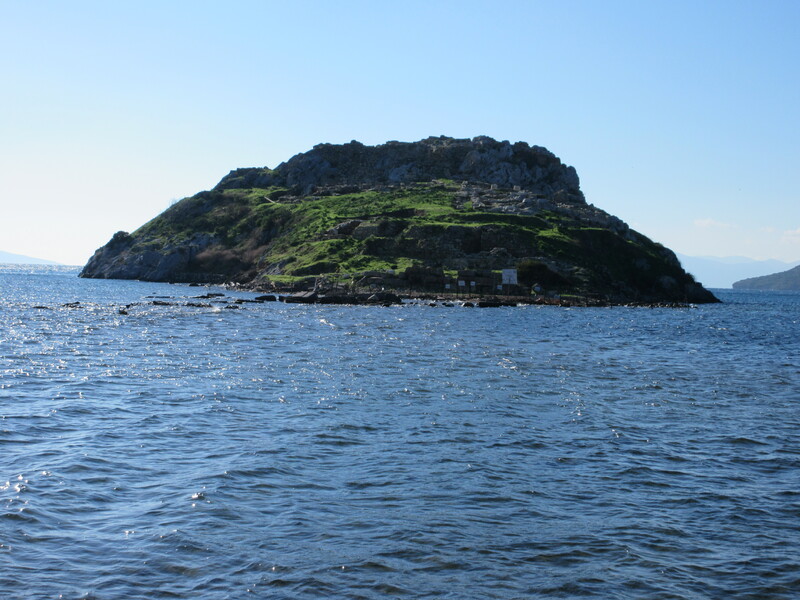 Parts of the Bodrum Peninsula have not been developed and are rugged. The mountains in the distance are on Greek islands. The busy municipal cafe in Gümüslük. Midday midweek off-season, it is busy with locals. Many of these cafes had people playing Rummikub or backgammon. Us up on a rocky promontory overlooking abandoned Sandima. 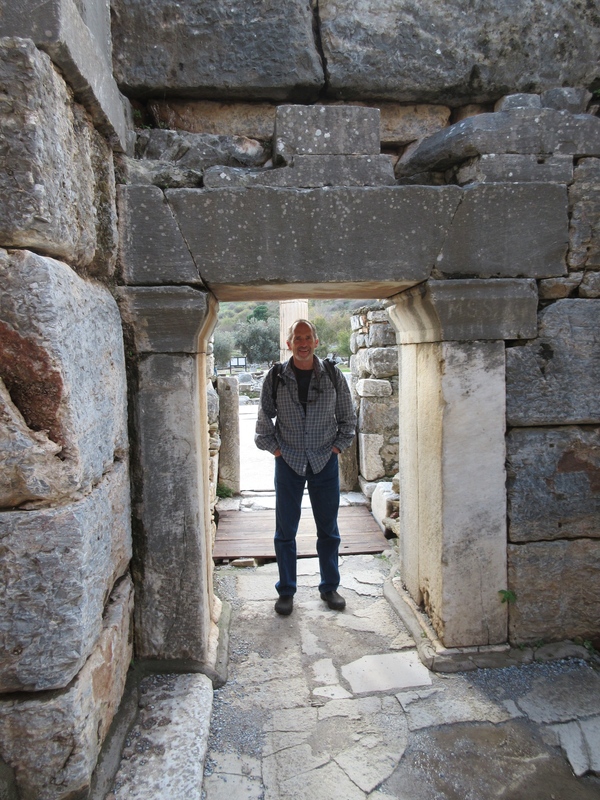 In addition to our trip to Ephesus, we explored the greater Bodrum peninsula. The entire peninsula is a tourist destination for Turks and Europeans. Many people return to the same resort every summer. The Istanbul jet-set fly down for the weekend to escape the city bustle and winter weather. 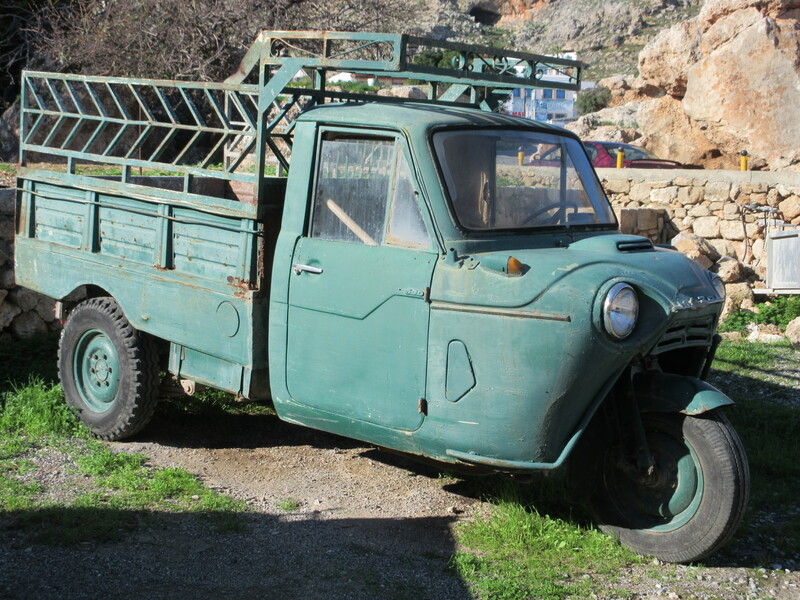 Despite this, some of the communities outside Bodrum have retained their small town flavor. With the excellent public transit system, we were able to take day trips to every corner. 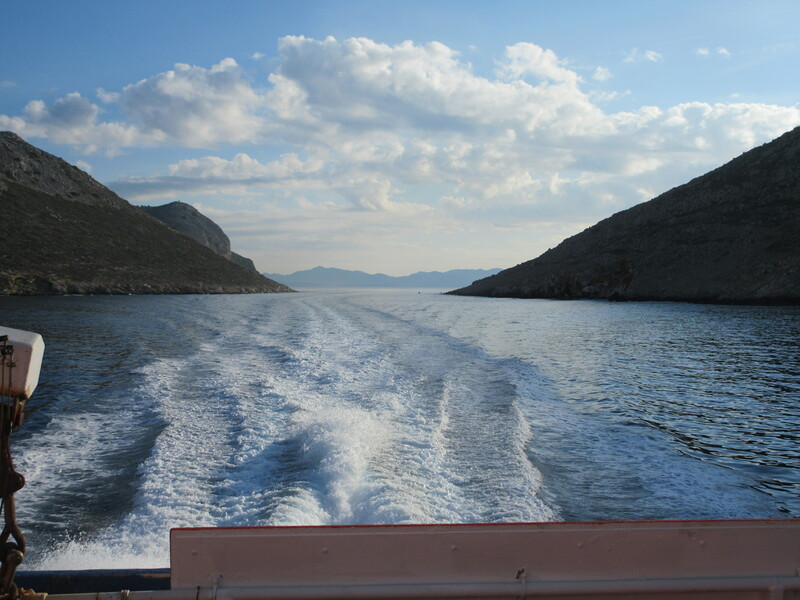 The coastline is rugged in places and views of the Aegean and Greek Islands are everywhere. Citrus season! You can buy a 2 pounds of these guys for less than a dollar! 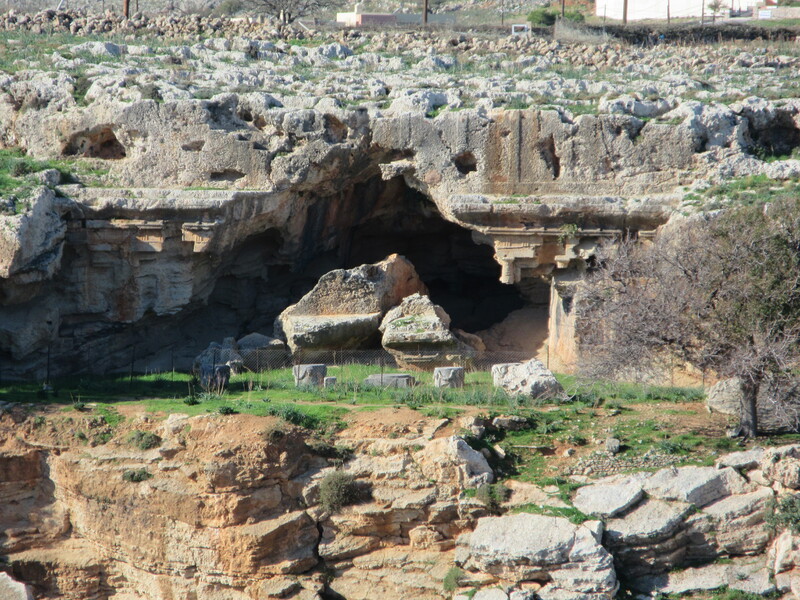 One afternoon we discovered a fun juxtaposition, the towns of Yalikavak and Sandima. Yalikivak seems to have embraced wealthy yachters. We walked by fancy shops, art galleries, fashionistas, and a large marina for mega yachts. A short walk from the strip is a thriving community with many gardens and orange groves. Providing quite a contrast, Sandima is an abandoned village above Yalikivak. It is a 30 minute walk from from downtown. 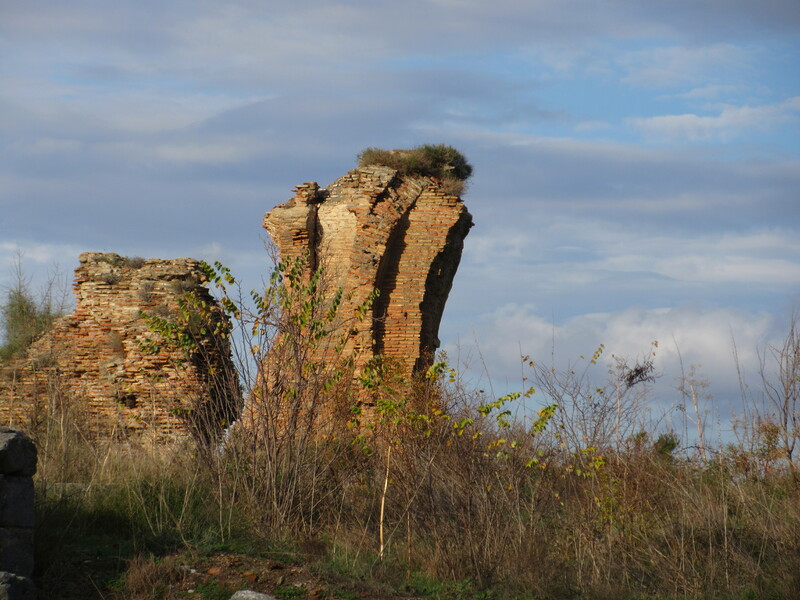 Stone houses stand silently in various states of disintegration. Very few have roofs, most have lost part of a wall. 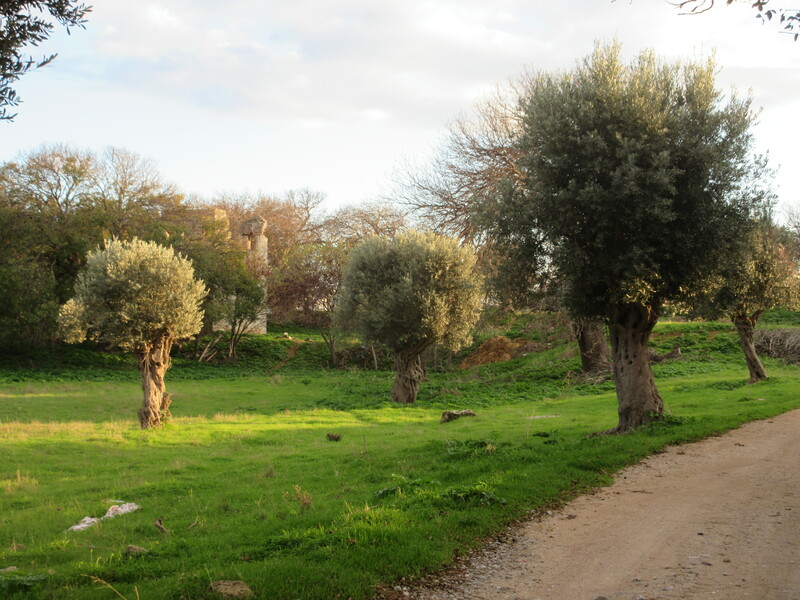 The orange, pomegranate, and olive trees are reminders of habitation. The houses are scattered on either side of a gentle valley, full of grazing goats and small caves. 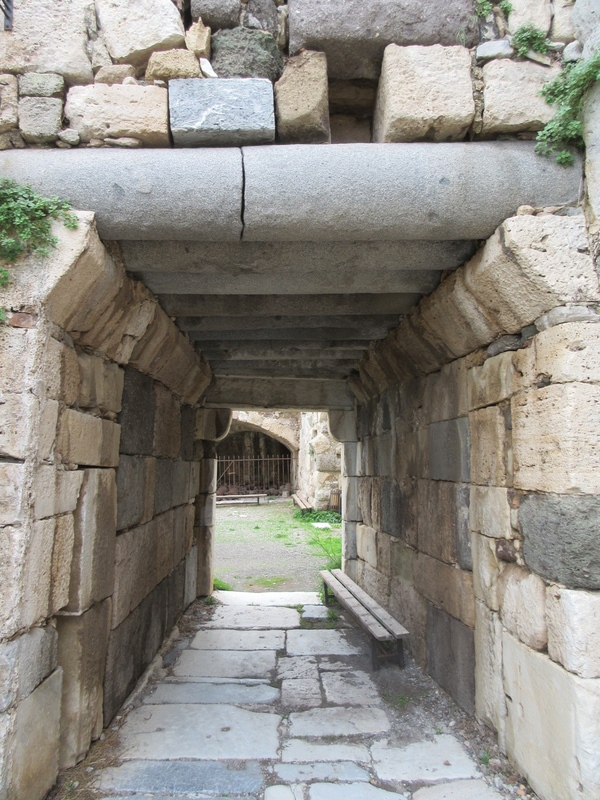 Part of the ancient Greek city Myndos. This island is covered with ruins and connected to the mainland at low tide by an ancient causeway. 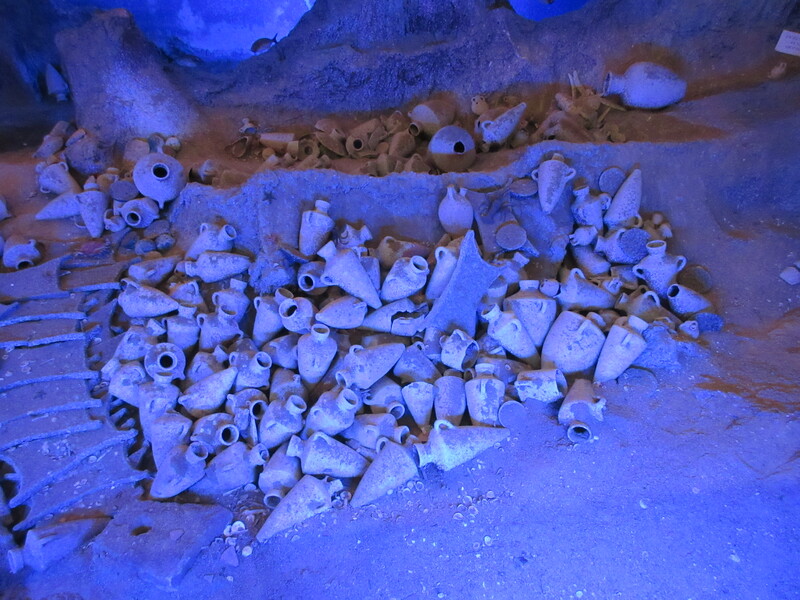 One of our last discoveries in Bodrum was the maritime museum with a fantastic display of model ships and the most astonishing collection of seashells I’ve ever seen. There are about 5000 of them. Some looked like candies, some like punk jewelry, some like galaxies, and some beyond description. Bodrum and the nearby Greek Islands were a center for sponge diving. 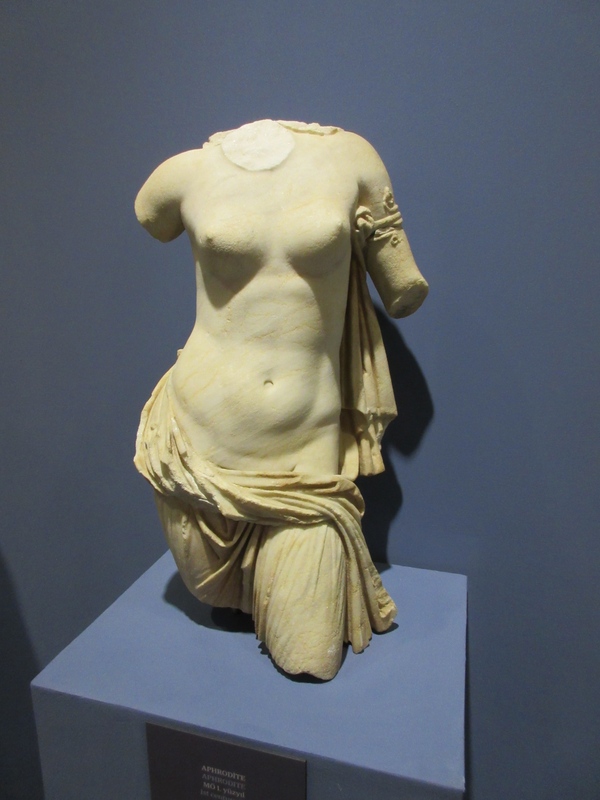 Early commercial divers tied a slab of marble around their necks and used it both as a weight and hydroplane to steer their dive. As new technology came along, divers could go deeper and longer but they did not understand decompression sickness, or “the bends.” They estimate that 20,000 divers suffered debilitating injuries and 10,000 died from ascending too quickly before sponge diving was banned. Apparently it was Mediterranean women who put up enough of a fight for it to end; they didn’t want to lose any more of their sons, brothers, or husbands. 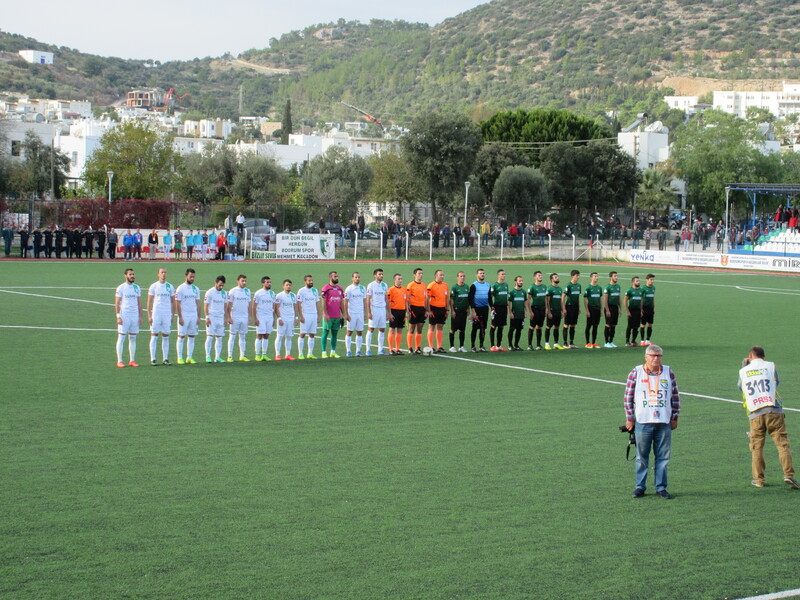 You can see all our pictures from Bodrum here if you wish to see more. Abandoned village of Sandima on the Bodrum Peninsula. 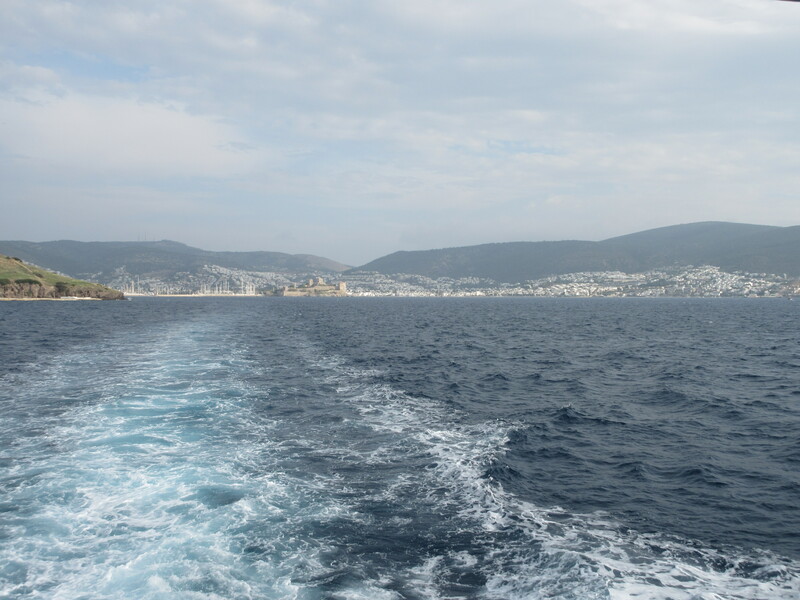 Bodrum receding as we take a ferry to the Greek Island of Kos. 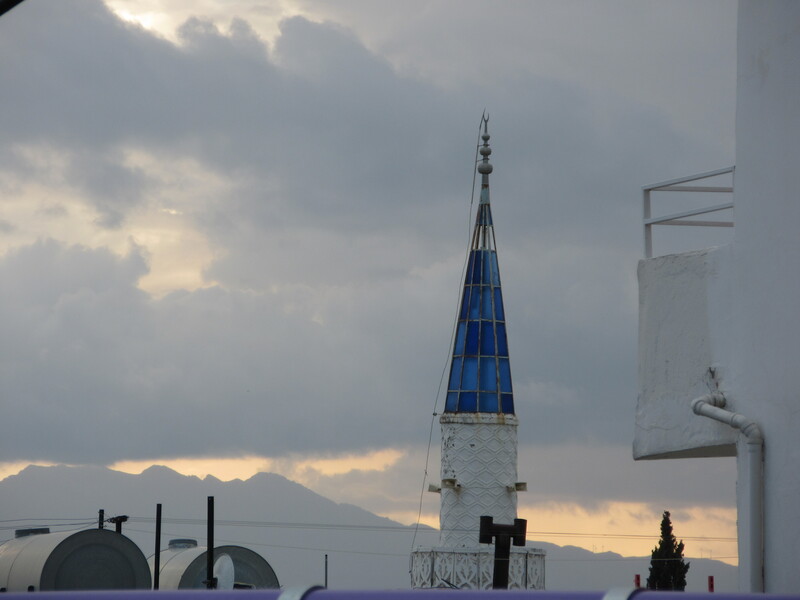 The minarets around the Bodrum Peninsula are mostly topped with blue glass. 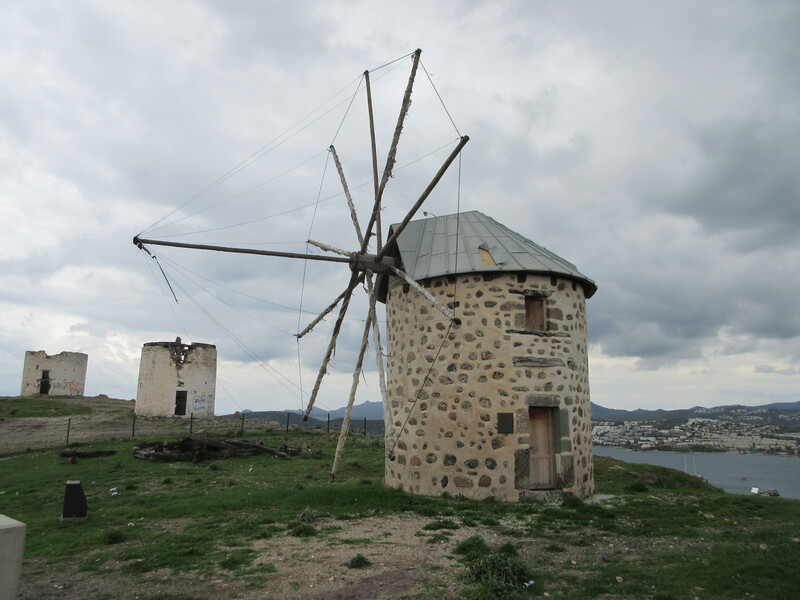 Windmills are all around the Bodrum Peninsula. They were used from the 18th century up to the 1970s to mill flour. Most are falling down today. 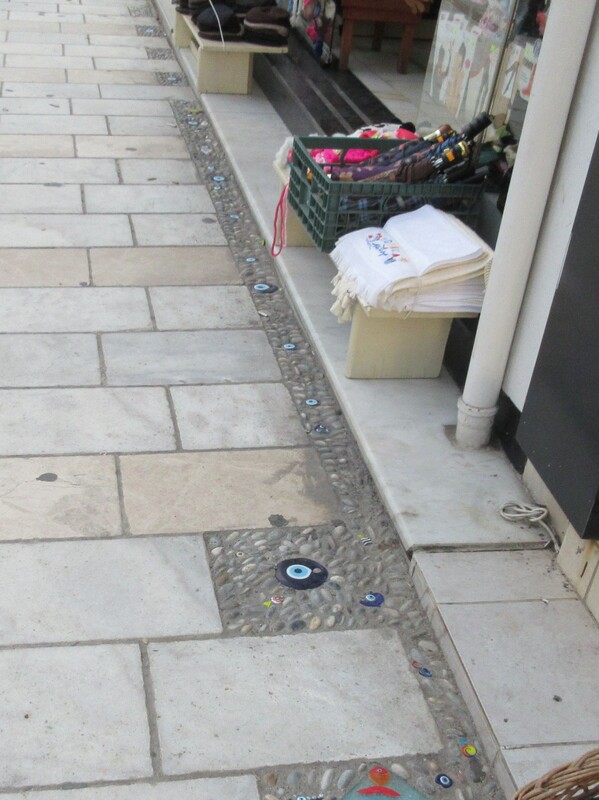 The blue eye amulets, called nazar, are everywhere and often built into walls and sidewalks. It is believed to provide protection from the Evil Eye and likely dates back to the 16th century BC when glasswork developed. Down a neighborhood street we came across these seemingly random ruins. We hear that most building projects uncover things like this. 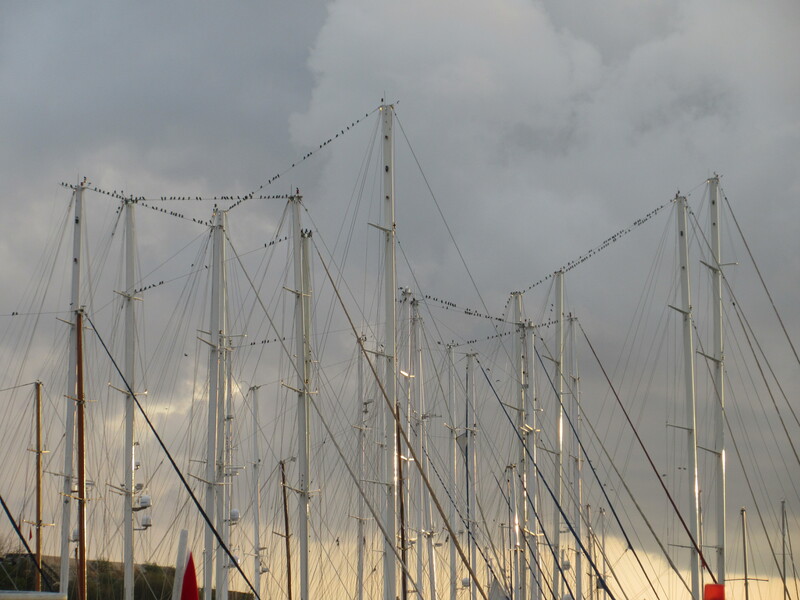 Birds on the rigging, Bodrum Harbor. 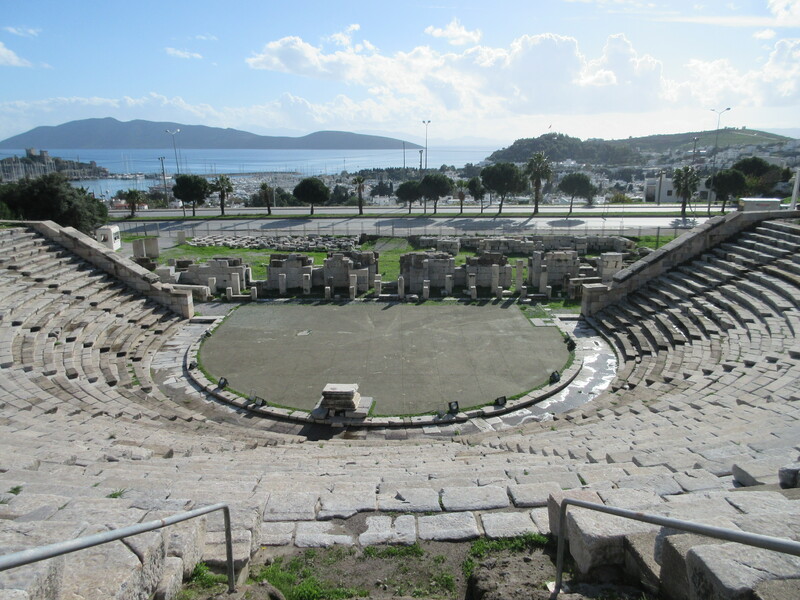 The ancient Greek theater in Bodrum. 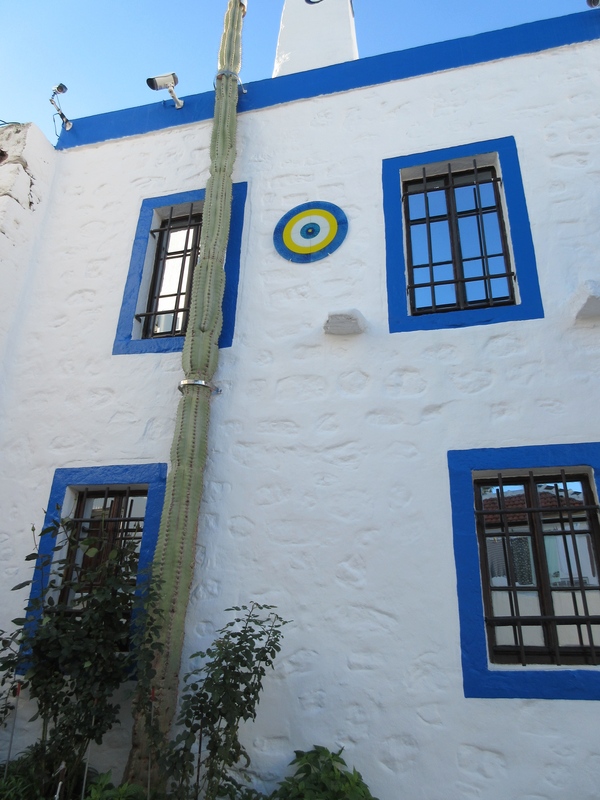 A typical Bodrum house with blue trim, white walls, and protection from the evil eye. Note the extremely tall cactus! American tourists take center stage, as usual. A wooden roof would have sat on these columns, shading pedestrians. 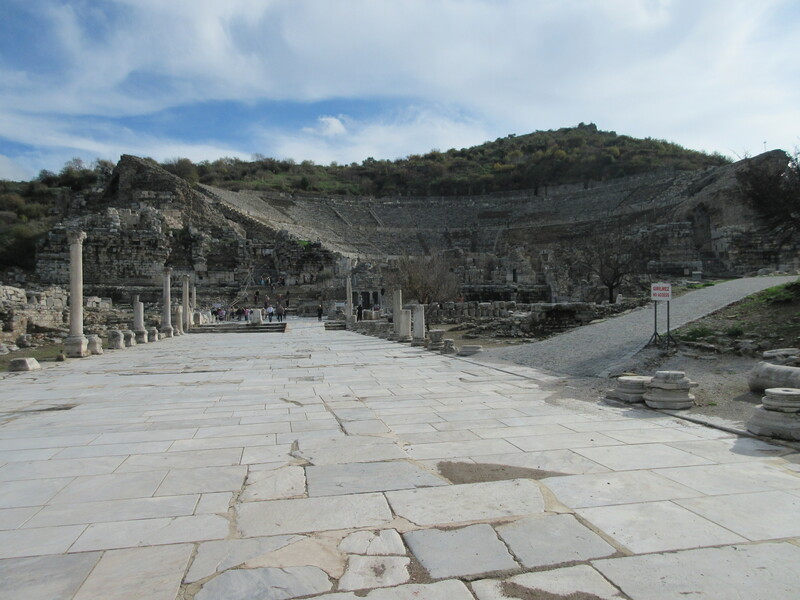 The highlight of our time in Turkey was a trip to Selçuk to visit the ancient city of Ephesus. Ephesus is remarkable for it’s size and condition. At it’s peak, the estimated population was 250,000. It hosted wealthy Romans and stories say that St. Paul and Mary (Jesus’s mother) came here together and later that Mary retired near Ephesus. 18% of the walled city has been excavated so far and we spent a day exploring it; it’s huge! 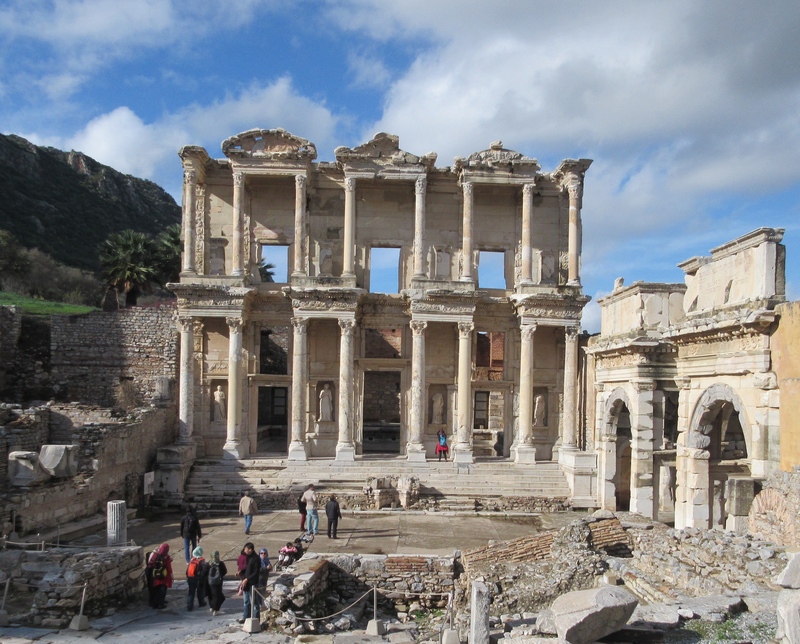 In its day, Ephesus was second only to Rome in size. 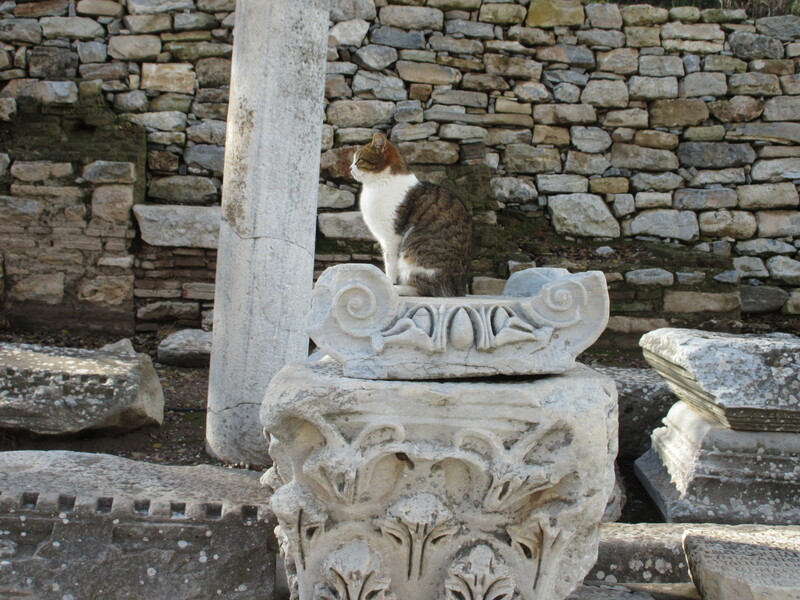 Unlike many other old cities, Ephesus was pretty much abandoned in the 7th century so archaeologists don’t have newer buildings to sort through, just a lot of rubble and earth. One thing the Greeks and Romans knew about was city planning. 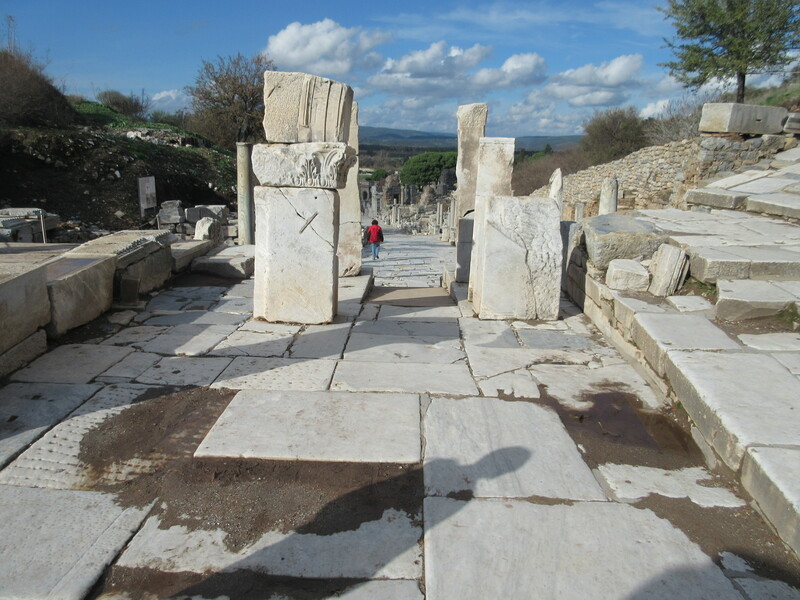 Ephesus was laid out on a geometric grid around 300 BC and the lines are based upon the nearby Temple of Artemis (one of the seven wonders of Ancient World). The core area had gates and stairs designed to exclude wheeled traffic; they were preserved as pedestrian malls. Under roads, pipes transported both clean water and sewage. 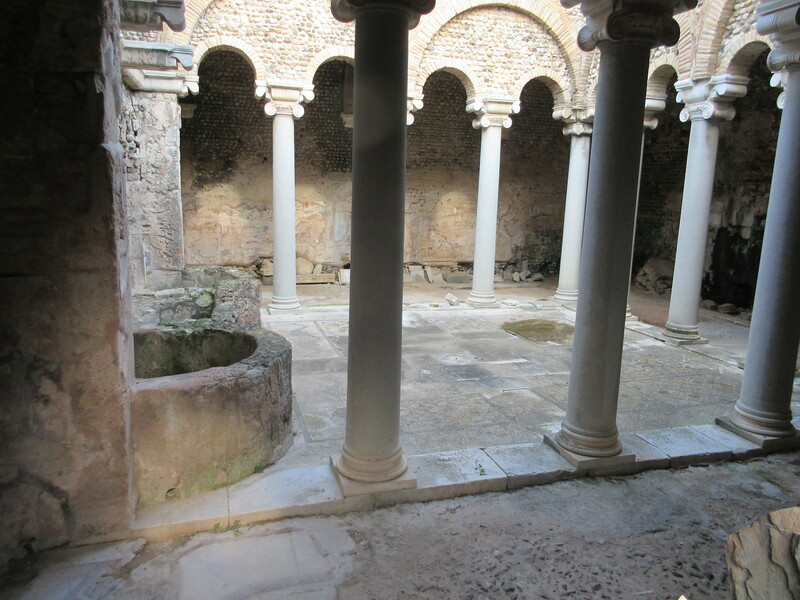 Fountains were common and allowed all access to clean drinking water. 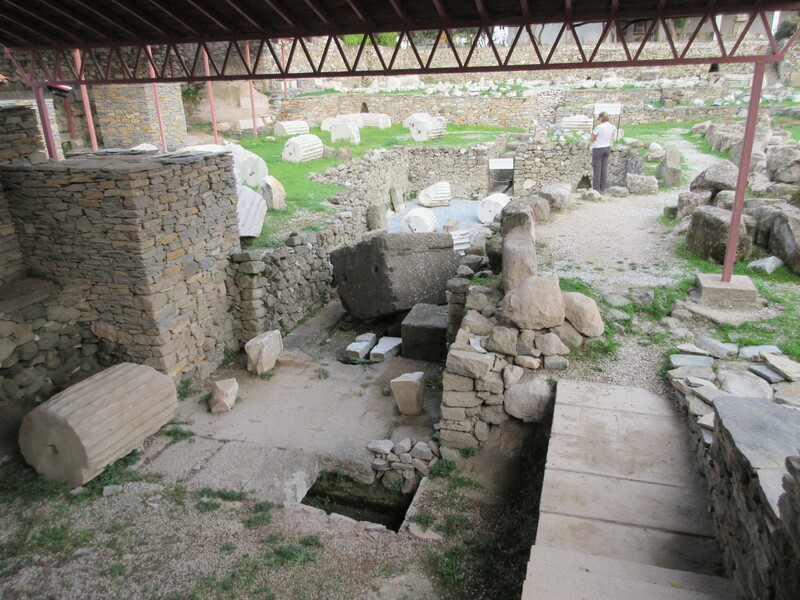 The city had multiple public baths and toilets. The main roads are even said to have had street lamps lining them at night! 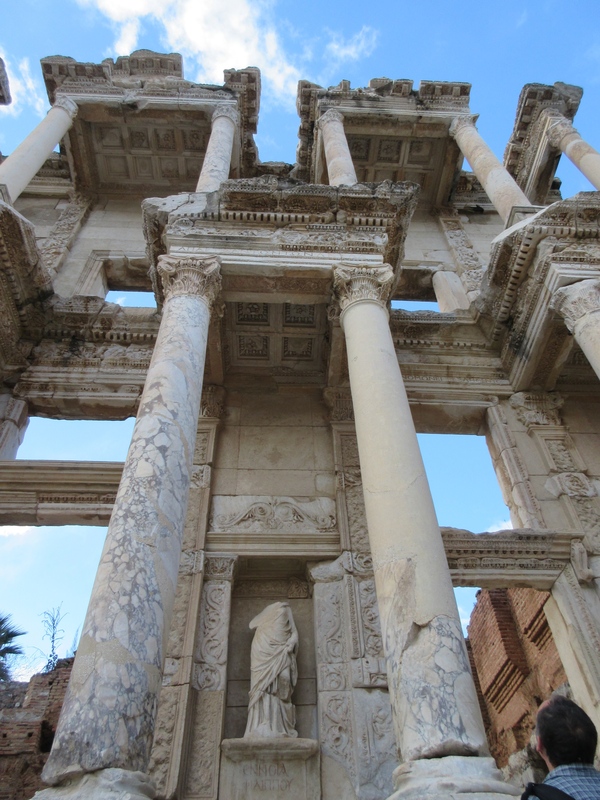 One of the most glorious buildings is the Celsus library. It was designed to hold 12,000 scrolls. Building construction minimized the effect of climate to protect the fragility of these early books. Today the facade stands nearly complete, thanks to restoration. The enormous amphitheater could hold 10% of the population and gave us an indication of just how large a space it takes to fit 25,000 people. 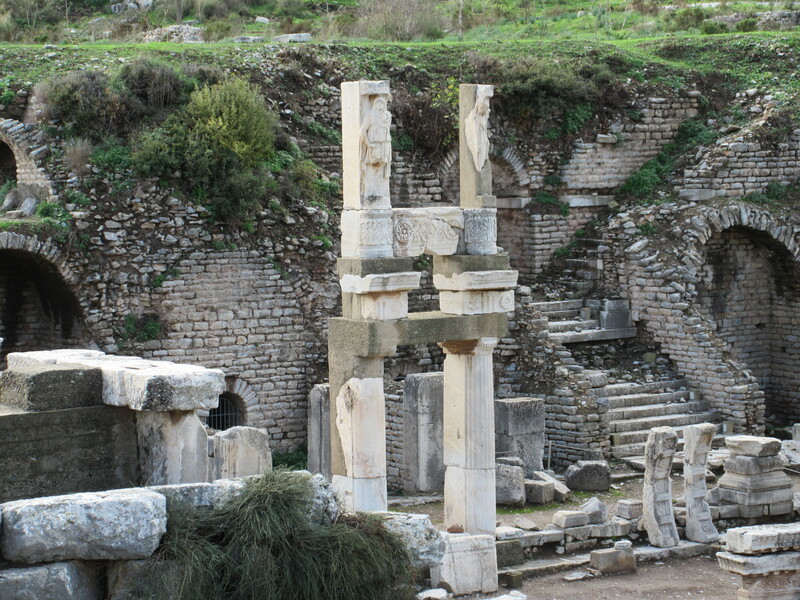 The first settlement at Ephesus was 8000 years ago. 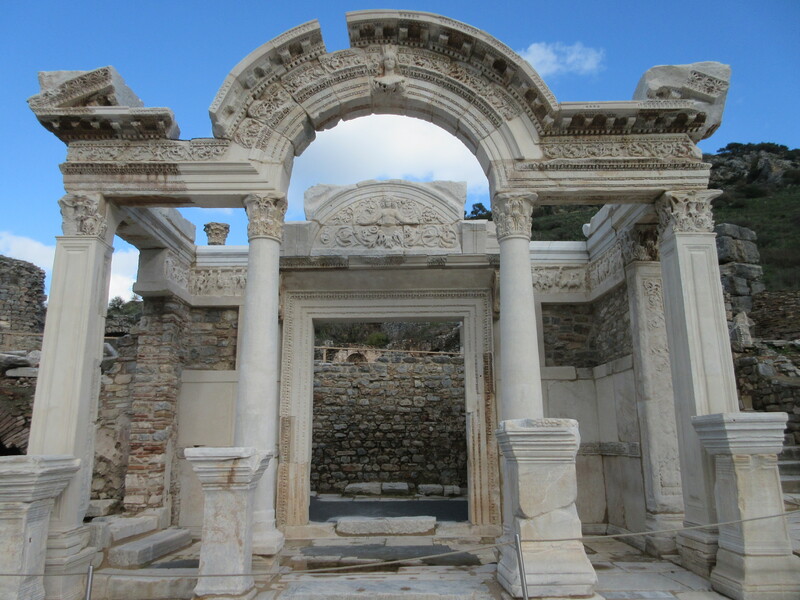 Ephesus became most prominent and wealthy under the Romans between the first and third centuries AD. Mass exodus began not long after and only a couple centuries later the area was abandoned. Two significant factors were at play. First, multiple large earthquakes toppled buildings and the Romans were not interested in rebuilding yet again. It’s also likely that the earthquakes may have been interpreted as displeasure from the gods. Second, the original city was built with a small walled harbor in the edge of a large bay. The Meander River (yes, that is where the name comes from) poured silt into the bay at an alarming rate and the harbor become disconnected from the sea. 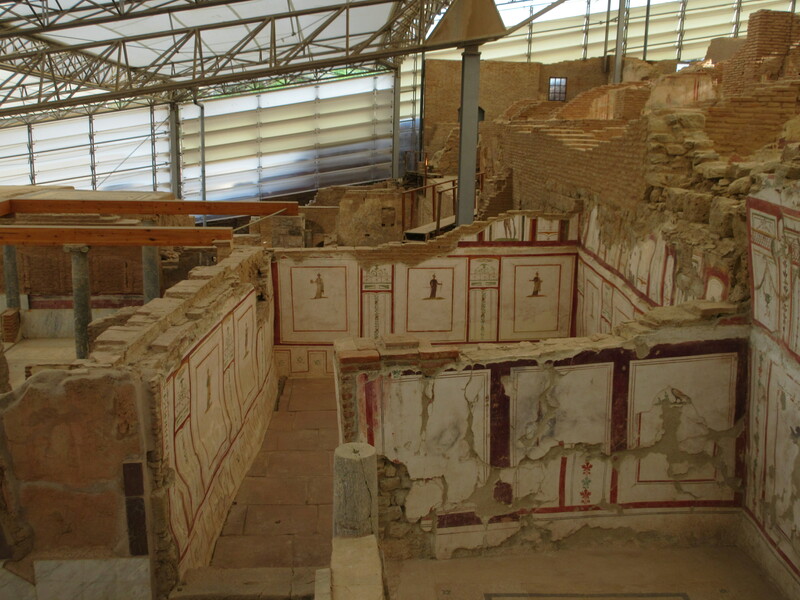 Without the possibility of trade or sea transport, Ephesus became extraneous. Today the sea is five miles from the original harbor. One of the most remarkable bits of restoration is what they call the Terrace Houses. Houses like these lined the core streets and were where the very wealthy lived. 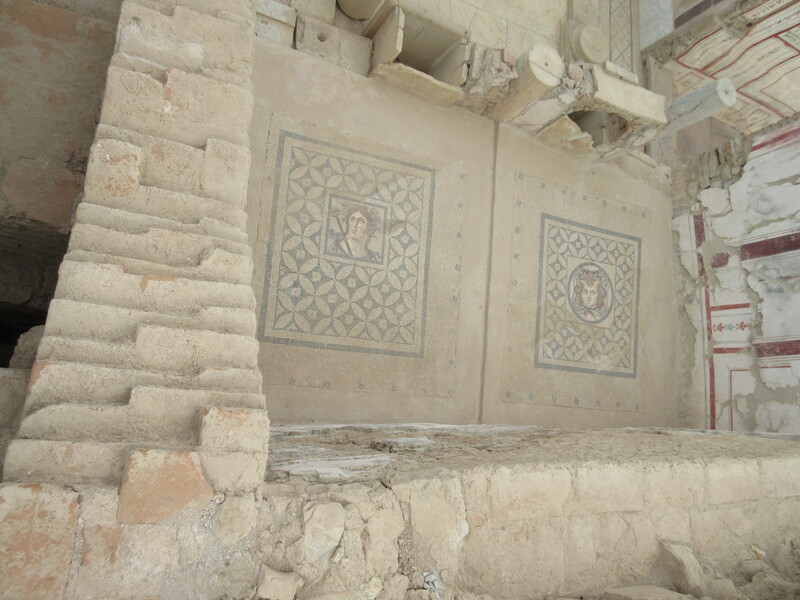 They were richly decorated with marble, mosaic, and frescos. Raised walkways allow tourists today to peer into rooms and courtyards without interrupting or damaging the ongoing restoration work. Because these houses were abandoned after being severely damaged by an earthquake, they have been a rich source for archaeologists. 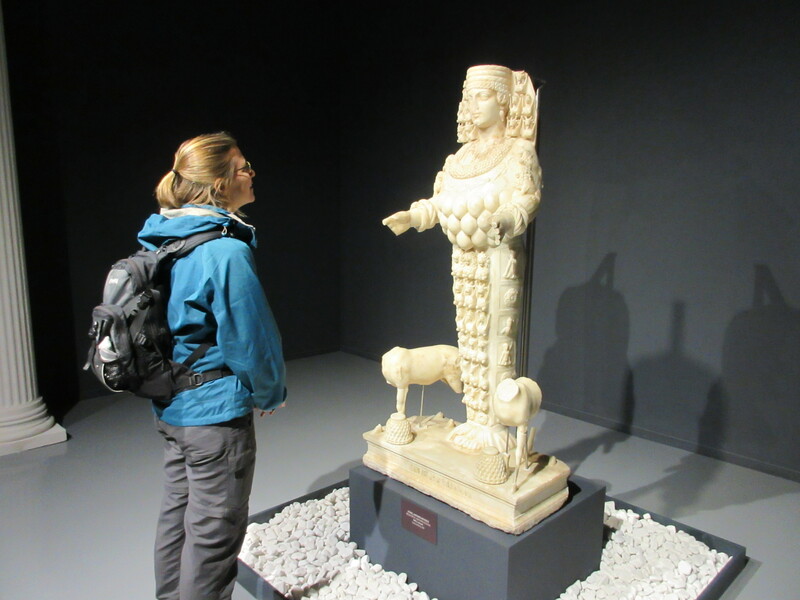 In the Ephesus Museum we saw many of the smaller pieces of art that were found in these houses as well as some of the larger statues from monuments in the town. 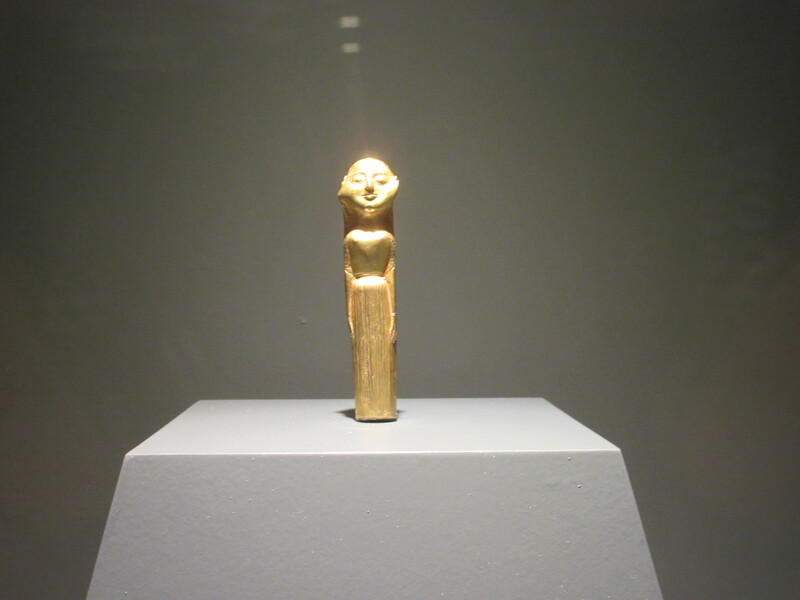 Like everywhere we have been, all the real gems from these ancient places are far away in museums in Europe or America. My favorite story we learned has to do with the strength of the goddess Artemis. 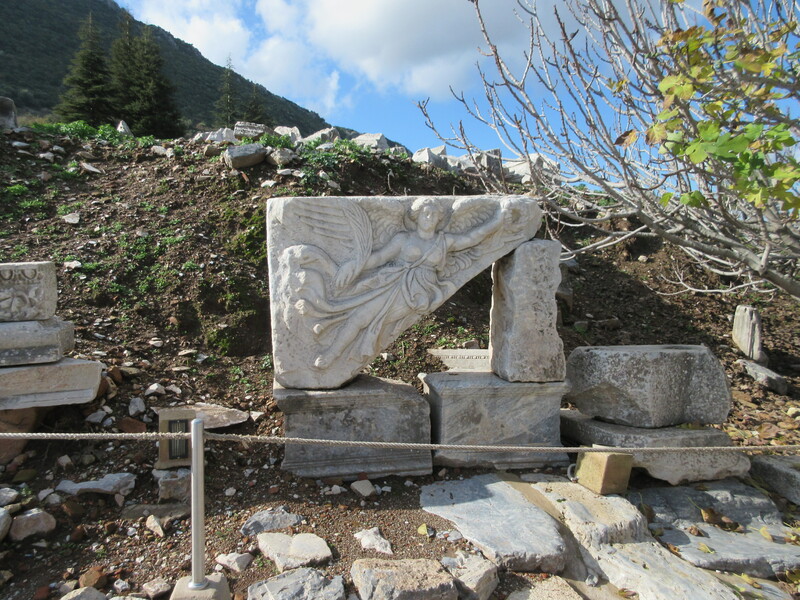 Around Ephesus was a sacred area long before the Greeks arrived and it appears the indigenous people worshiped a matron goddess. 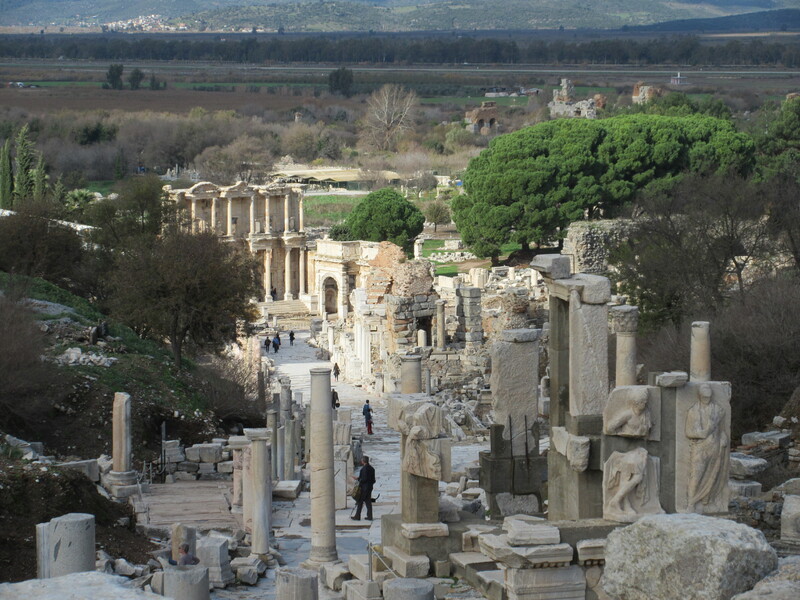 For many centuries, people were in process of constructing a temple to Artemis. Construction stretched on again and again as the temple was destroyed three times. 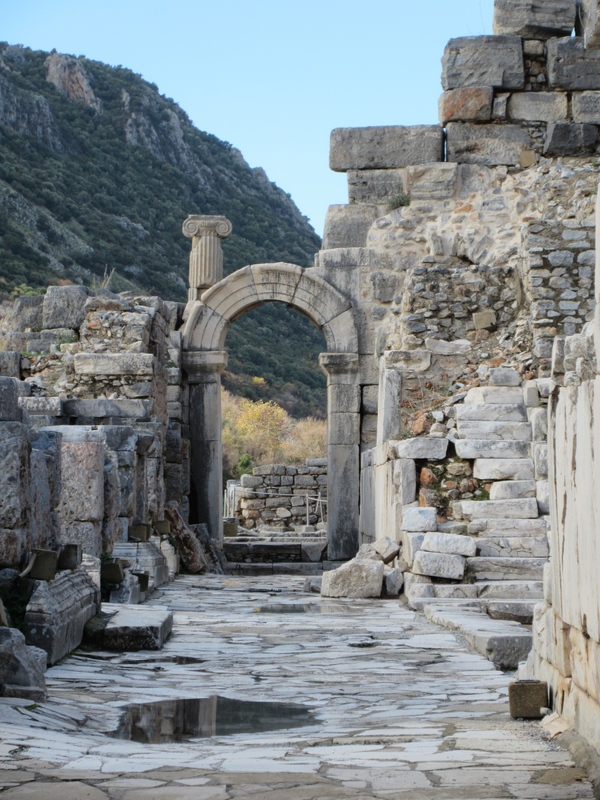 In the sixth century BC, the people of Ephesus heard that the King of Lydia was coming to attack. They tied a rope to a completion portion of the Temple of Artemis and stretched it several kilometers to their settlement, believing that Artemis would not allow the army to cross that line and her protection would travel along the rope to their homes. In one sense, it worked. The story goes that the king was so touched by their faith that he only conquered the people but didn’t destroy their temple. In fact, he donated to the construction effort! See more pictures here. Check out our new photo layout and let us know what you think. 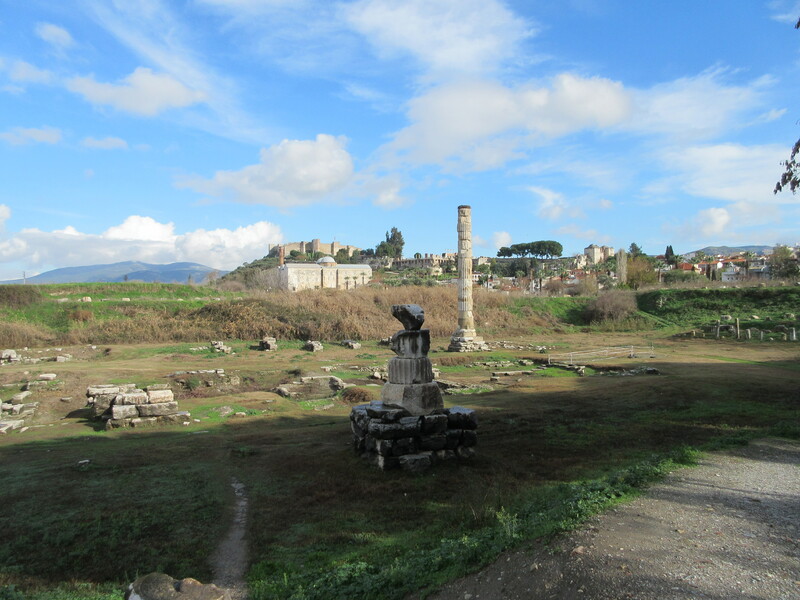 All that remains of the Temple of Artemis. This was one of the Seven Wonders of the Ancient World with 127 of these columns standing over 40 feet tall. 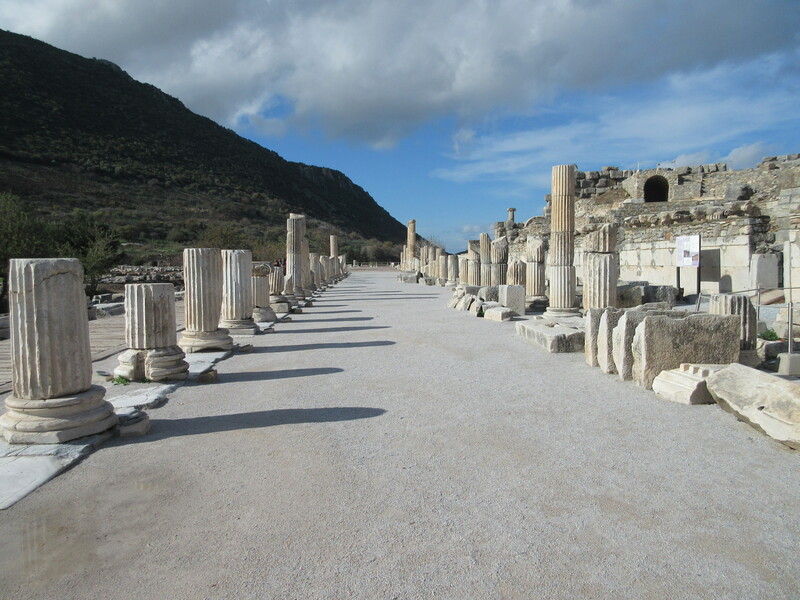 One of the main streets in Ephesus, looking toward the Celsus Library. The flat below was once ocean. 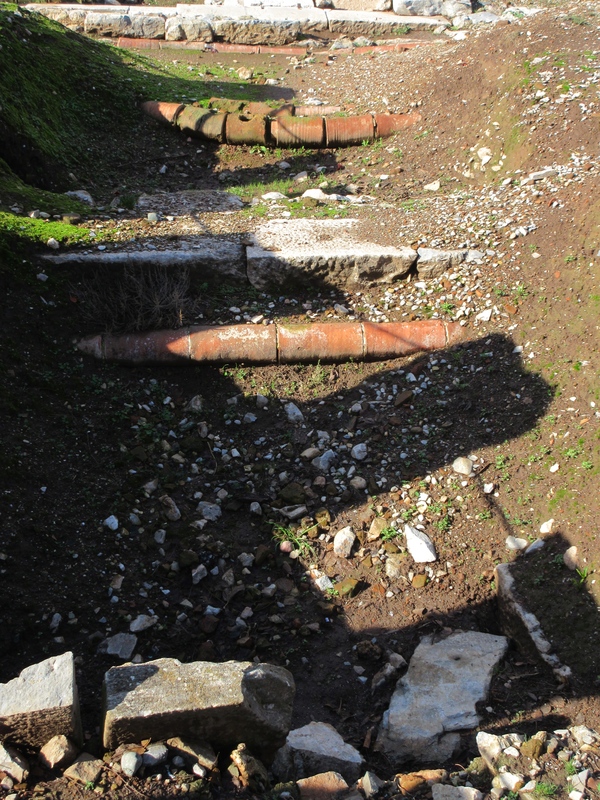 Under the roadways, these pipes carried in clean water and carried out sewage. Grooves in the marble pavers from the passage of thousands of carts. This street connected the harbor to the amphitheater. Some of the cut stones they built with are enormous. Temple of Domitian. 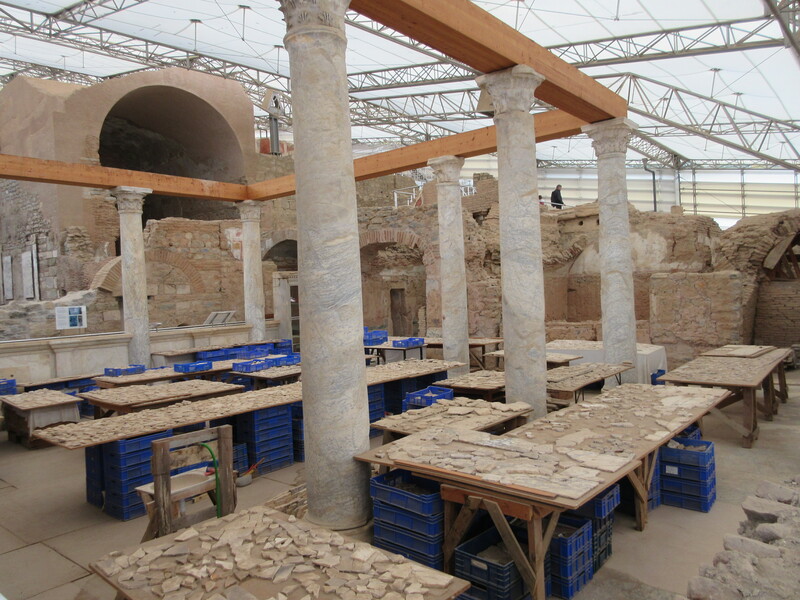 Note the un-excavated structure behind the columns. The Hercules Gate provided a physical barrier to carts, keeping the road below open only to pedestrians. Marble column with swirl patterns. 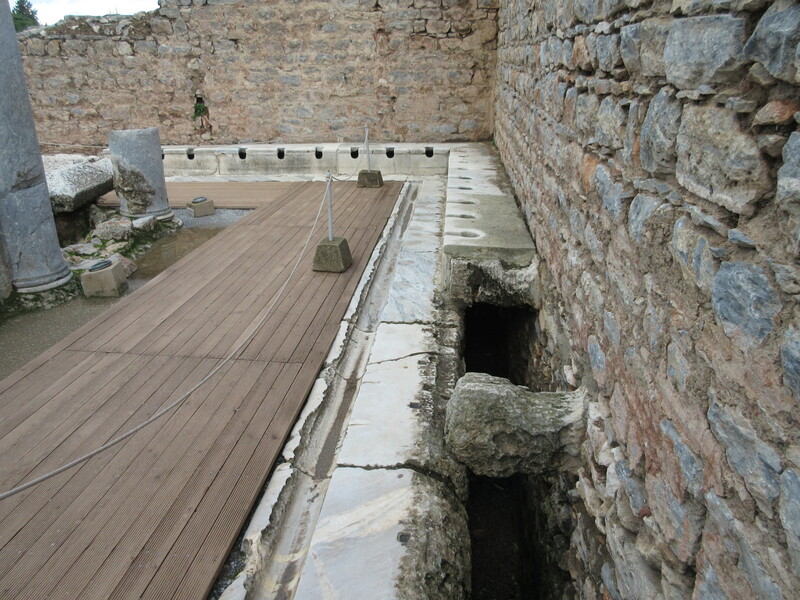 Part of one of the large public baths. A public toilet. Supposedly, wealthy clients had a reserved seat. Reconstruction in progress of a Terrace House. 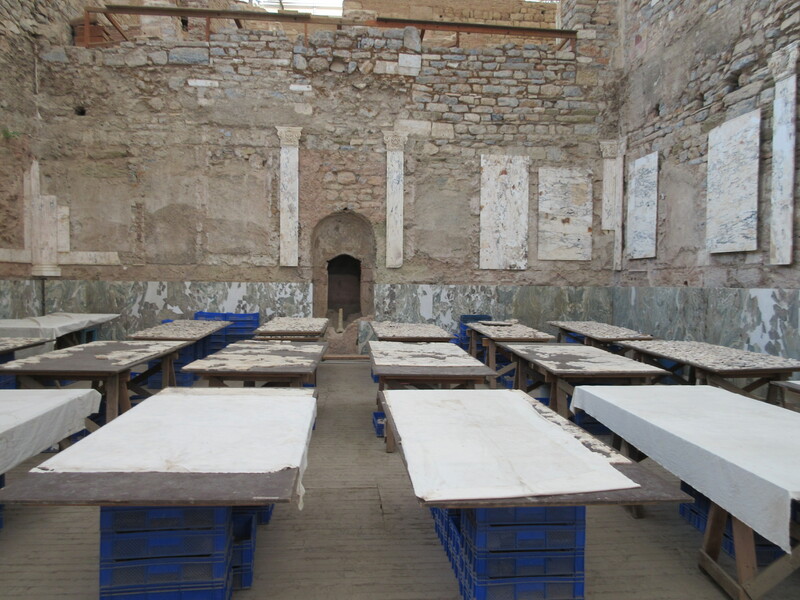 The walls and floor of this room were covered in sheets of marble. Layers of painted murals in a Terrace House. Floor mosaics from above, Terrace House. 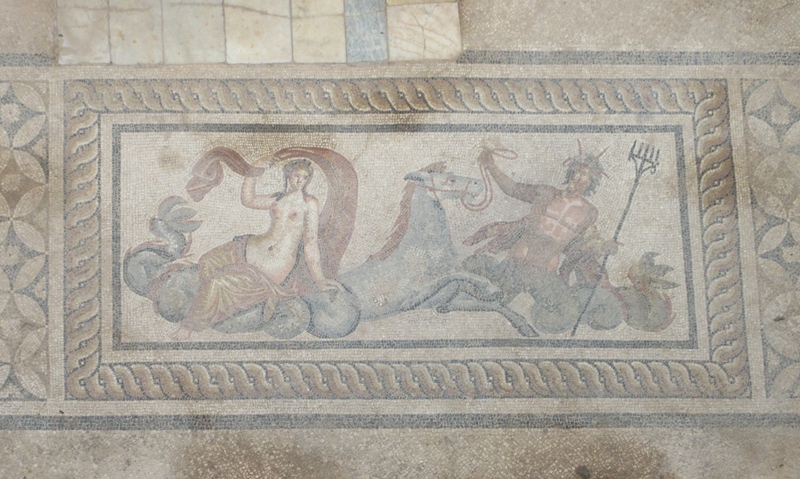 Floor mosaic of a woman riding a hippocampus, mythical Roman beast, and a god. 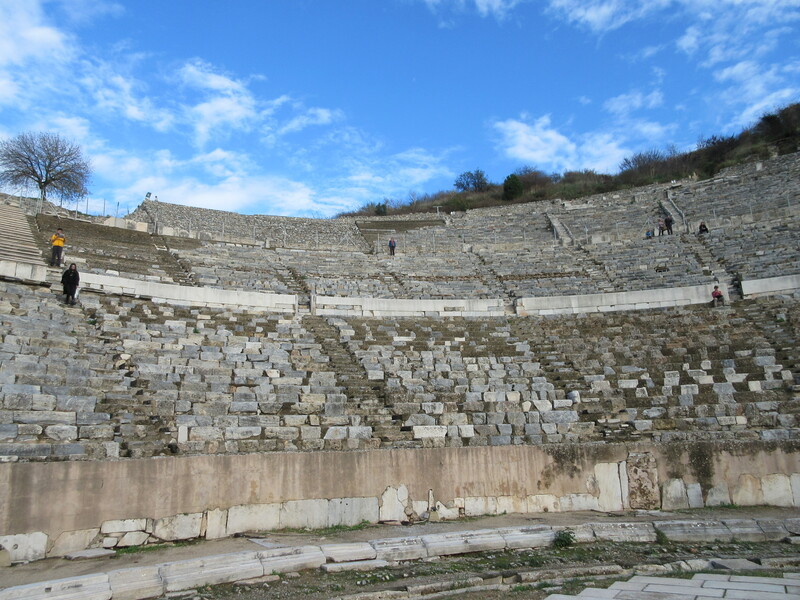 Ephesus amphitheater could seat 25,000 or 10% of the population. Megan is the dark spot near the center of the picture, in the upper rows. From the amphitheater, this road extended to the harbor, long since silted in. If you look closely you can see the sea now 5 miles away as a light glimmer. Megan taking history lessons from Artemis. 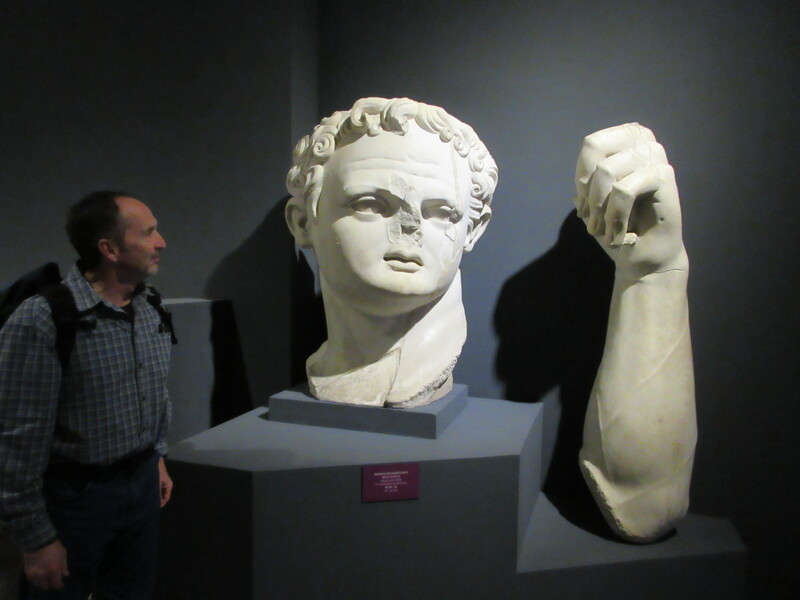 All that remains of a giant statue of a Roman Emperor. Shiny happy person, of solid gold. Hee-haw. Dolphin riding at its best. This trio was found in this arrangement at Terrace House. 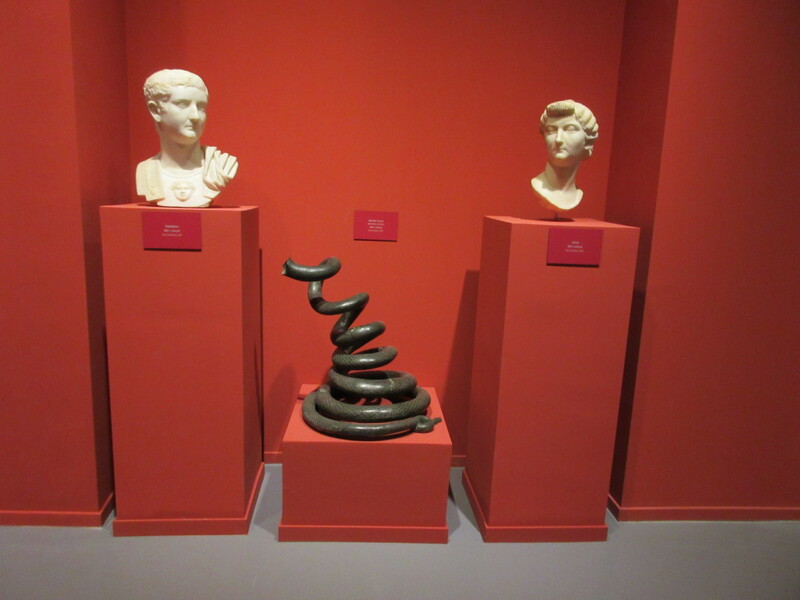 A couple and their bronze snake. 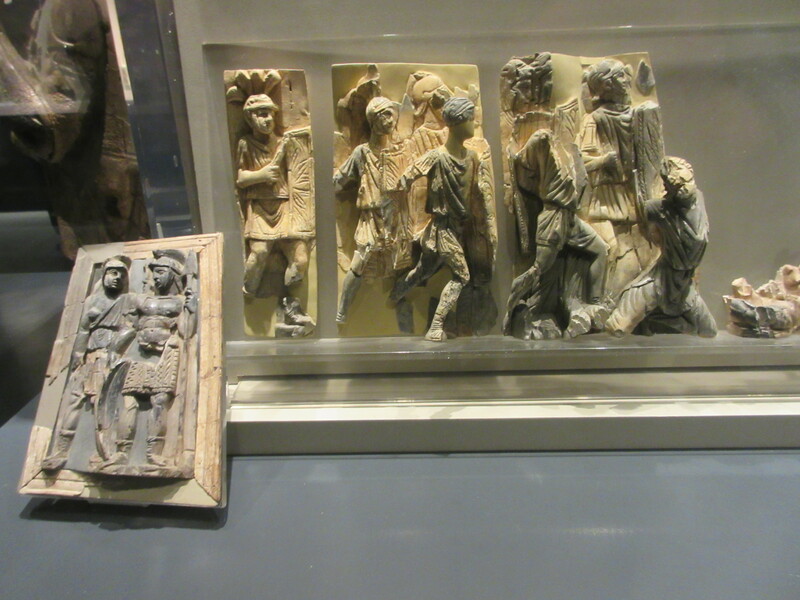 An ivory relief from a Terrace House. Bodrum. The Crusaders’ castle splits the bay in two. 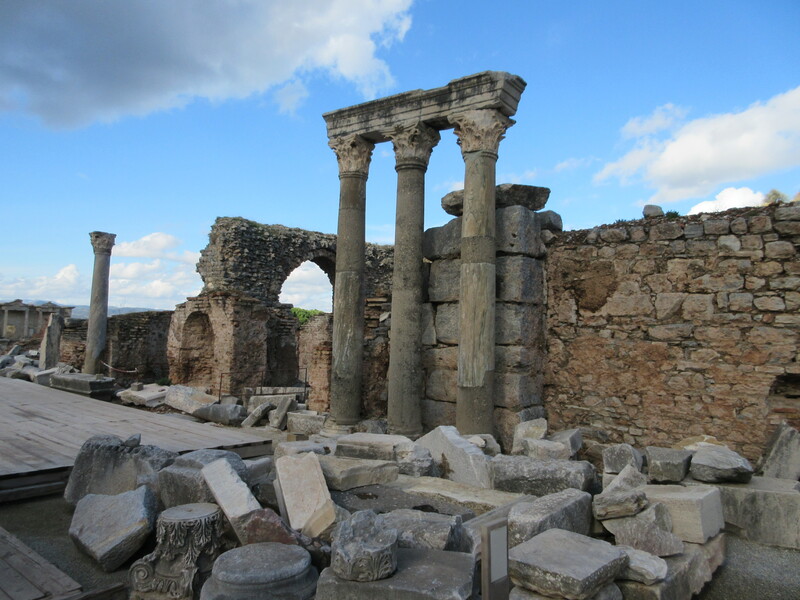 We’ve spent the last couple weeks down in the SW corner of Turkey in a place called Bodrum. 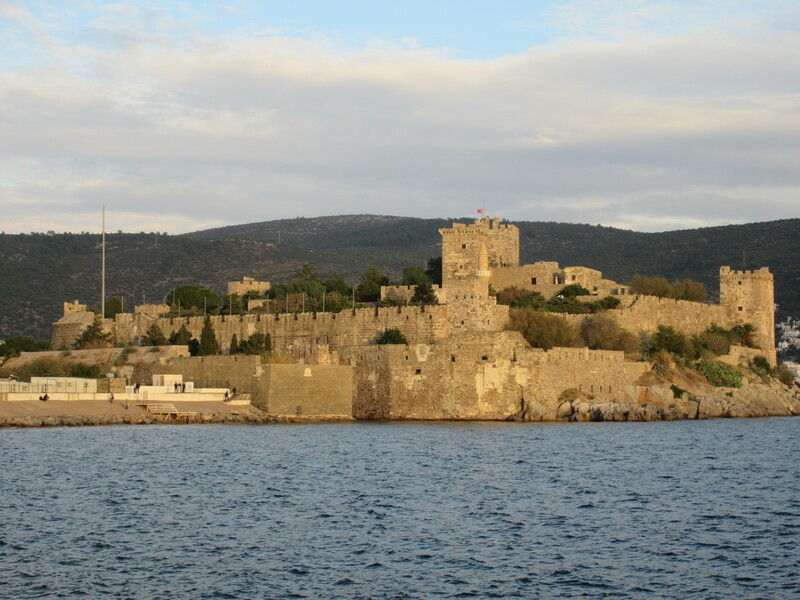 Bodrum was previously known as the ancient Greek city of Halicarnassus. 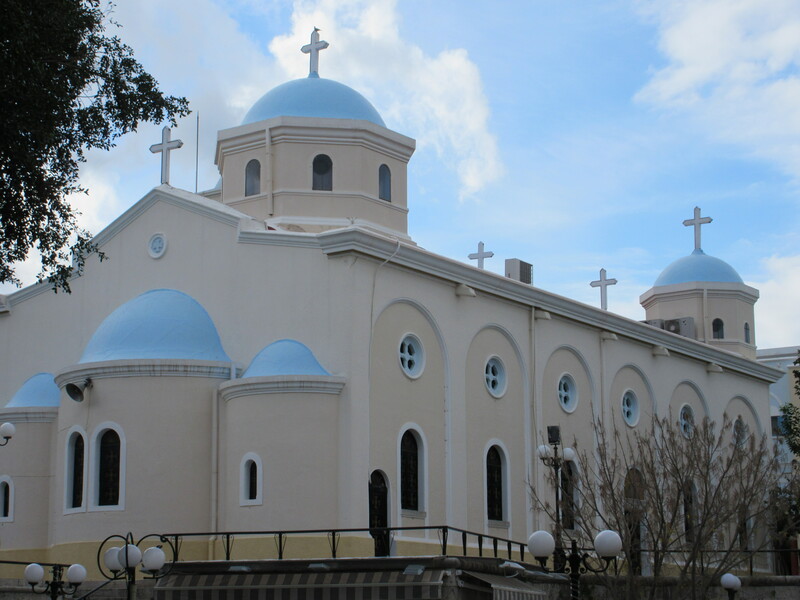 Like much of the Aegean and Mediterranean Turkish coast, the area has a long history. Recorded settlements at this location date back 3000 years with signs of people living more simply before then. 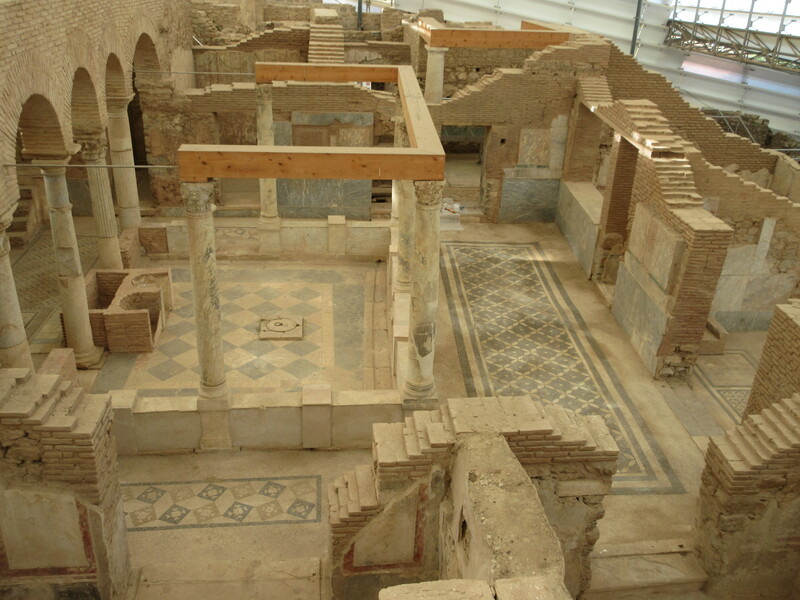 Roman and Medieval ruins are visible around town. They are built on top of and out of Hellinistic ruins. For example, when King Mausolus died his sister/wife built a tremendous burial monument to him here. It was one of the seven wonders of the ancient world and known as the Mausoleum (the source of the word we know today). After an earthquake damaged it centuries later, Crusaders used the stones to build a medieval fortress that today houses a superb museum. What is left of the Mausoleum today. The large rock in the center was installed as a plug to Mausolus’s tomb, which was deep under the monument. Modern day Bodrum has been a tourist destination for decades. 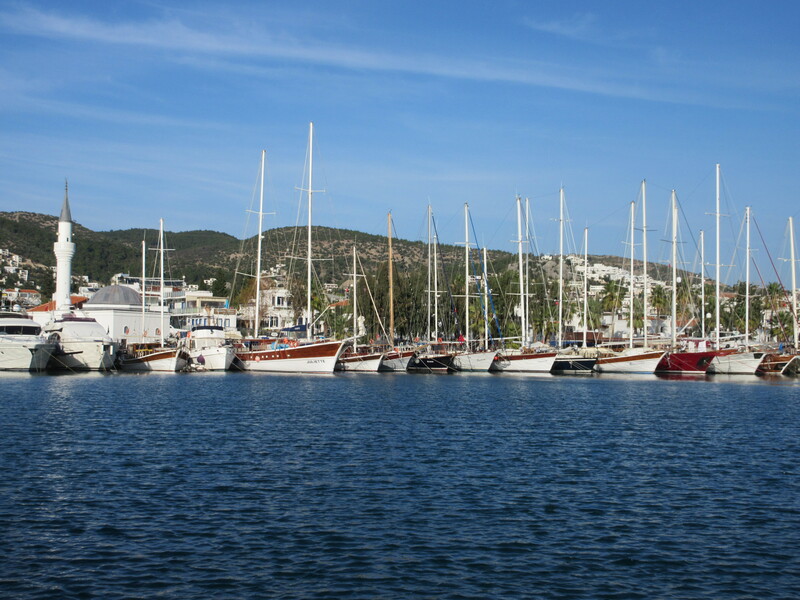 The protected harbor has hundreds of yachts, many the traditional gulet. The hills are covered with sugar-cube white houses and olive trees. In the summer this place is packed. 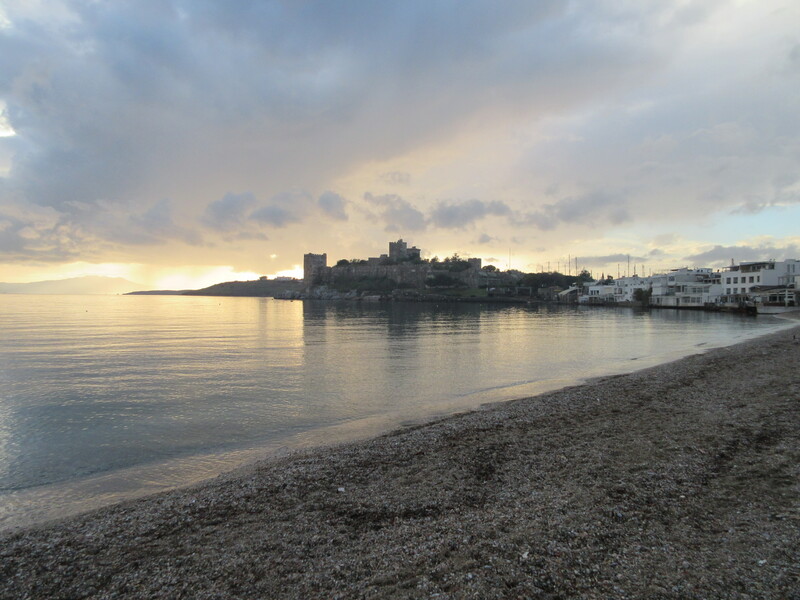 The Bodrum Peninsula extends to the west with a handful of smaller towns, beaches, bays, and hills. Now is decidedly the off-season and many things are closed up. The restaurants that stay open struggle to keep their best staff on payroll through the winter and offer some excellent lunch deals. We’ve spent our days exploring town and the peninsula. It must be a very different place in the summer with exponentially more people. Our biggest struggle here has been traffic. Our guide books discouraged us from driving in Turkey, explaining that it has a very high accident rate. Walking around town often feels dangerous. Clearly, we are westerners who are used to a different set of rules. I am outraged every time that a car or truck parks on the sidewalk, pushing pedestrians out into busy streets. Scooters drive on the road, on the sidewalk, in the alleys, and everywhere else. At times it feels like they have agreed to pass pedestrians with no more than five inches of clearance. Personal safety seems to not be a priority, which makes our favorite pastime, walking, a lot less pleasant. On the flip side, there is an excellent minibus system. We can get to anywhere on the peninsula for about $2. The minibuses run on a schedule, are clean and organized, and go every 15-45 minutes from early in the morning to past our bedtime. -Olives, honey, and tea are ubiquitous. Even the little minimart will have multiple types of honey and tea leaves in bags bigger than a loaf of bread. 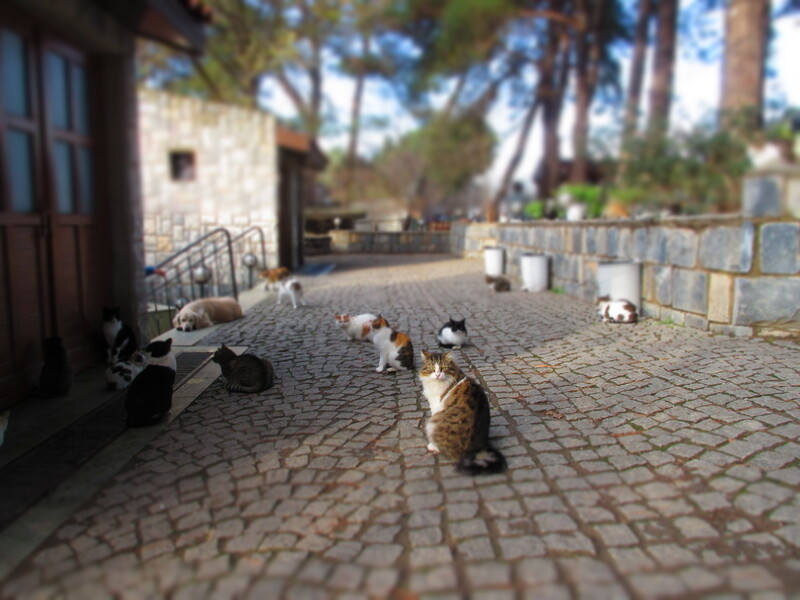 -Stray cats and dogs run the streets. It seems that many people are willing to feed them as few are scrawny. Large water and food bowls are not uncommon. Other than wanting a scratch or accepting food, they are generally not too interested in people. -The body language for yes and no is different: a nod down means ‘yes,’ a nod up means ’no,’ and shaking your head means ‘I don’t understand.’ Fortunately for us, they are pretty used to foreigners but we’ve had some hilarious misunderstandings at the market as we attempt to specify how many kilos of mandarins or dried figs we want. -99.9% of the country is Muslim. The call to prayer echoes off the hillsides five times a day. Men are seen socializing in public more often than women are. 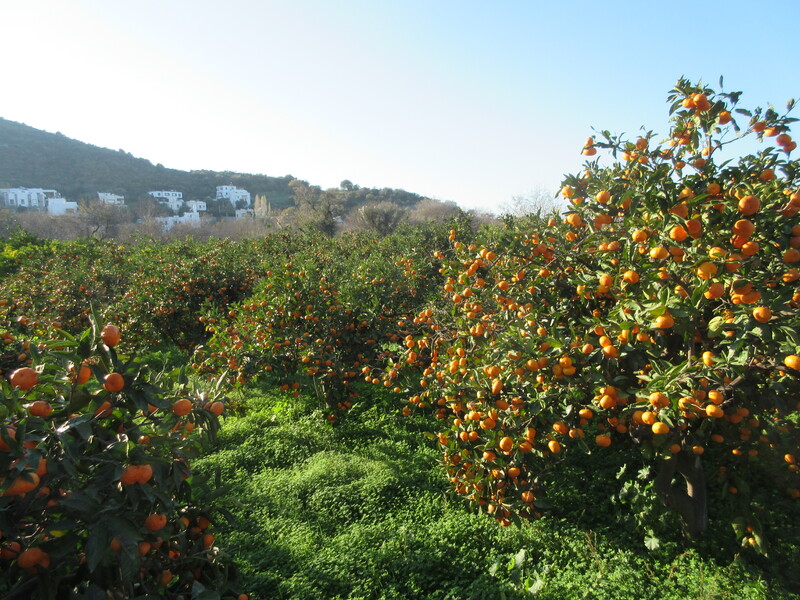 -Mandarins are in peak season and we’ve taken to eating them by the kilo as they are so delicious and really cheap. Many of the landscaping trees in town are citrus so it is not uncommon to see a passerby picking what they can reach. -Public nationalism is strong. Large flags and images of Ataturk (the father of Turkey) hang everywhere. Historical plaques paint a rosy picture of Turkish strength. It is illegal to speak poorly of the Turkish government. 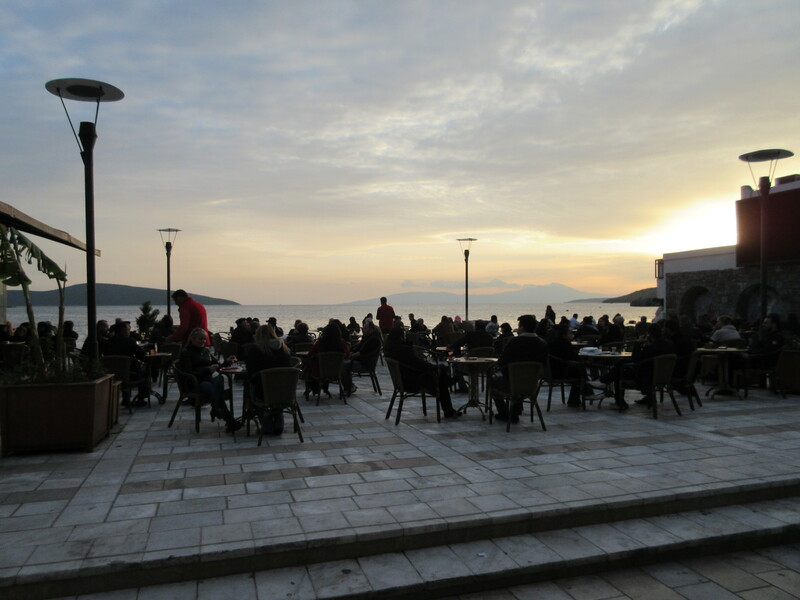 One of the busy waterfront cafes in Bodrum. -The cafe scene here is even stronger than in Paris or Split. Each town has a cafe that is municipally owned where coffee and tea are very cheap and nearly every table is full all day long. Many have piles of board games for customers to use. Hordes of men wile away the afternoon with backgammon. Stay tuned for the next post with some specific places and excursions. 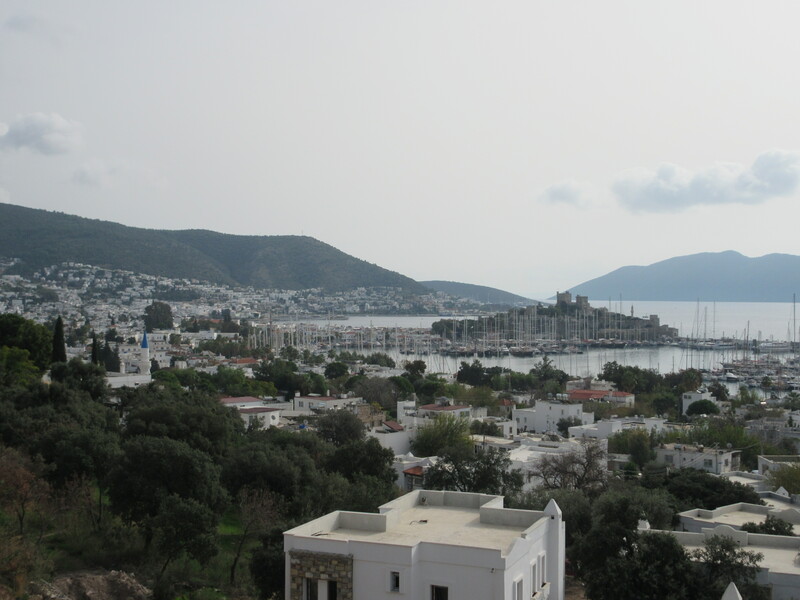 In the meantime, you can check out more pictures of Bodrum here and look at our map to see where Bodrum is. 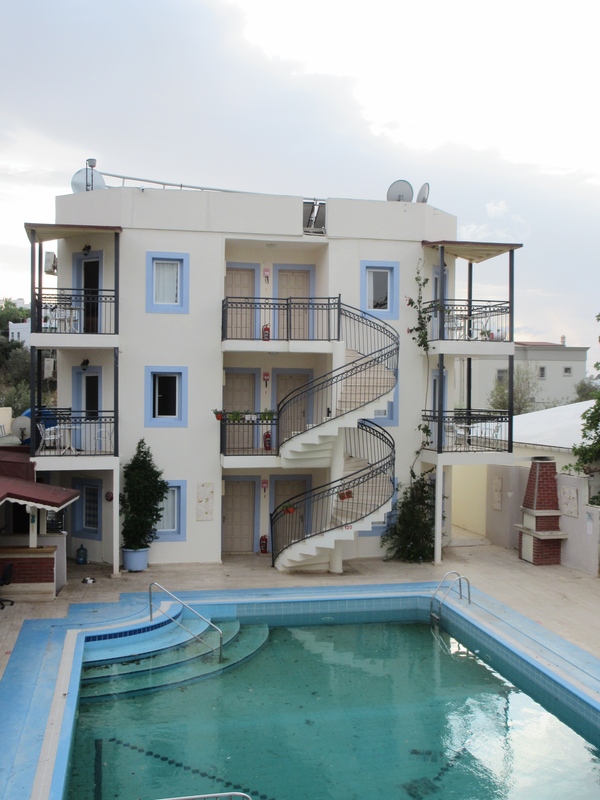 Our apartment in Bodrum is on the middle floor. 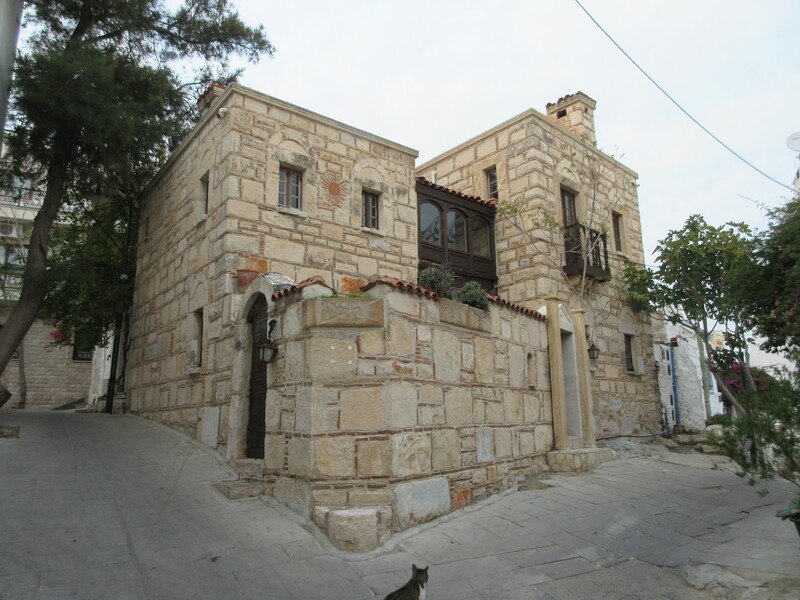 We were surprised how few old architecturally significant buildings there are in Bodrum, given the long history. It turns out earthquakes have demolished the city several times and unnoticeable small ones occur almost every day. 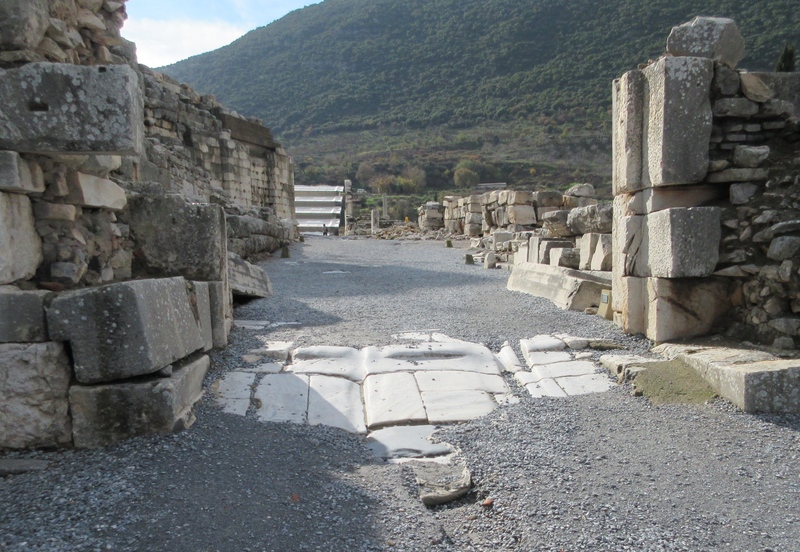 One of the original gates into Halicarnassus. 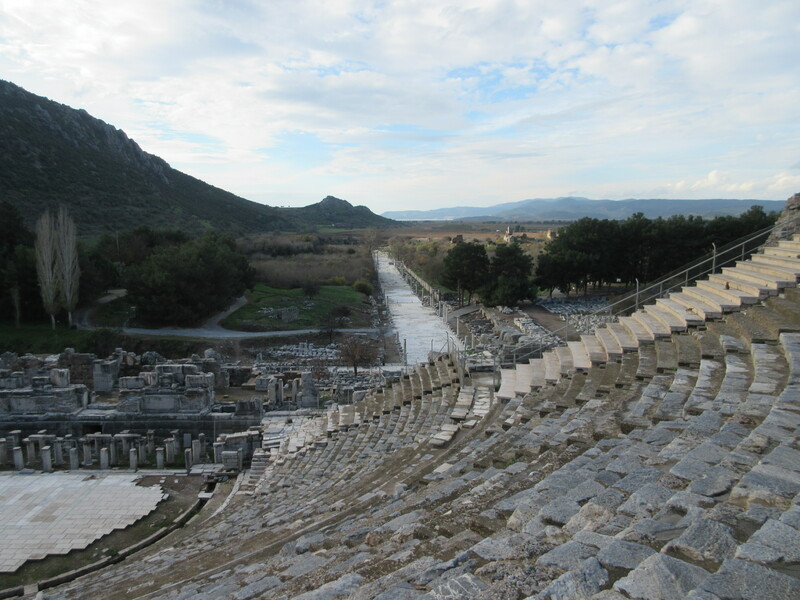 When Alexander the Great attacked in 334 BC, a fierce battle ensued here. Note Megan standing in the entrance. A Sunday afternoon soccer match between the local amateur team and a neighboring community. The stands were full and police lined up (in the far left) in case things got too exciting. Castle built by the Crusaders in the 1400s out of stones from the Mausoleum. 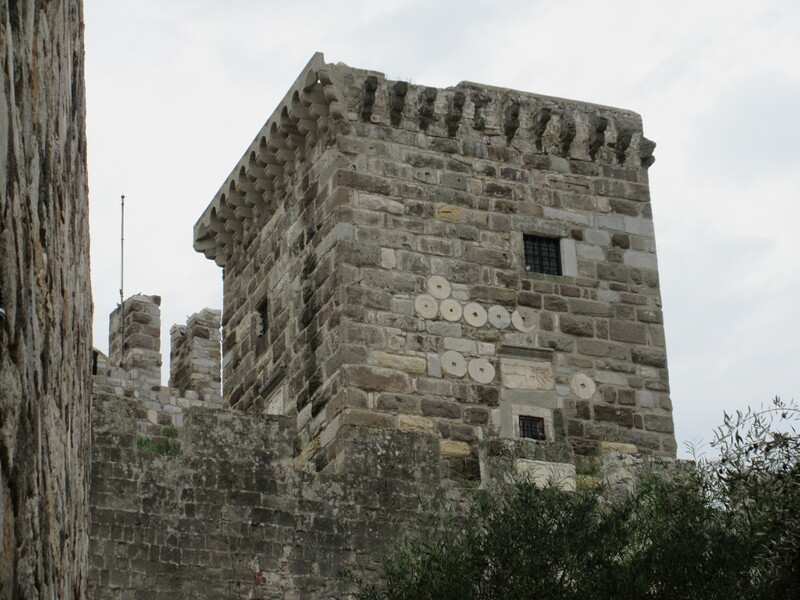 The Knights of St. John built the castle in Bodrum using stones from the then1700-year-old Mausoleum. 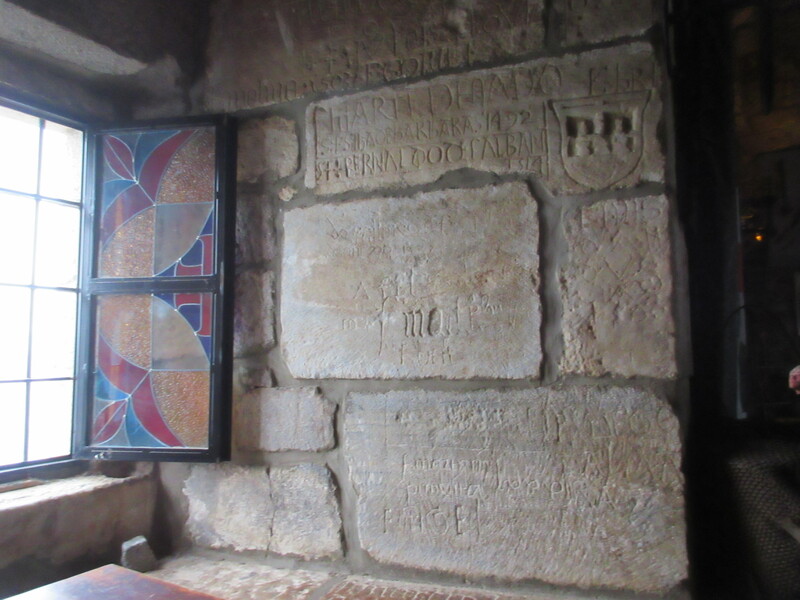 Inside the castle, Crusaders carved on the walls. The upper carving showing a crest is dated 1492.. 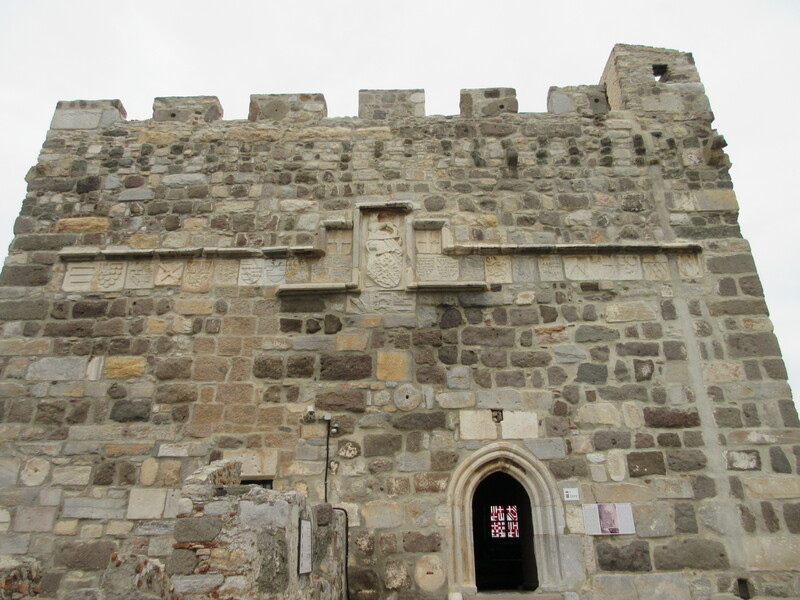 The Bodrum castle has many knights’ crests. You can see over 20 of them on this tower wall. A ship wrecked in the 14th century BC leaving amphora and ingots of copper and tin. 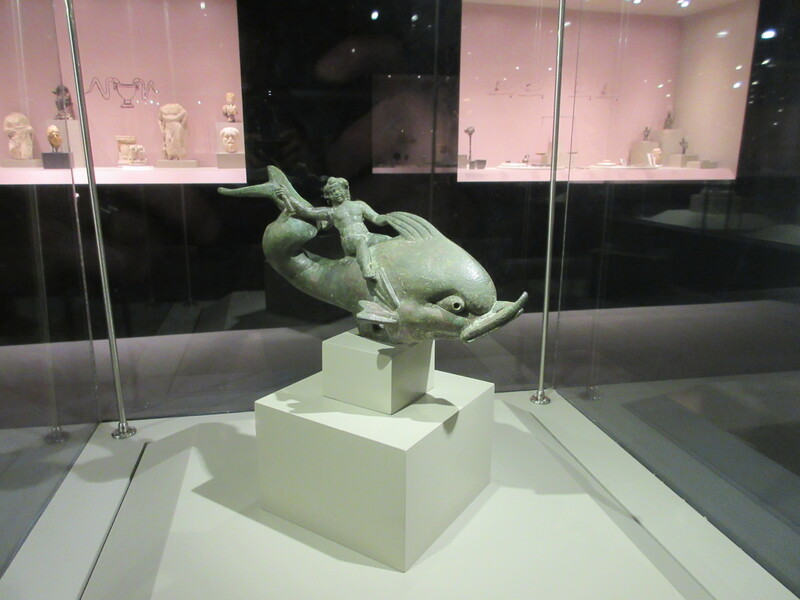 It took 22,000 dives over 11 years to excavate the site, recreated here in the superb Museum of Underwater Archaeology. 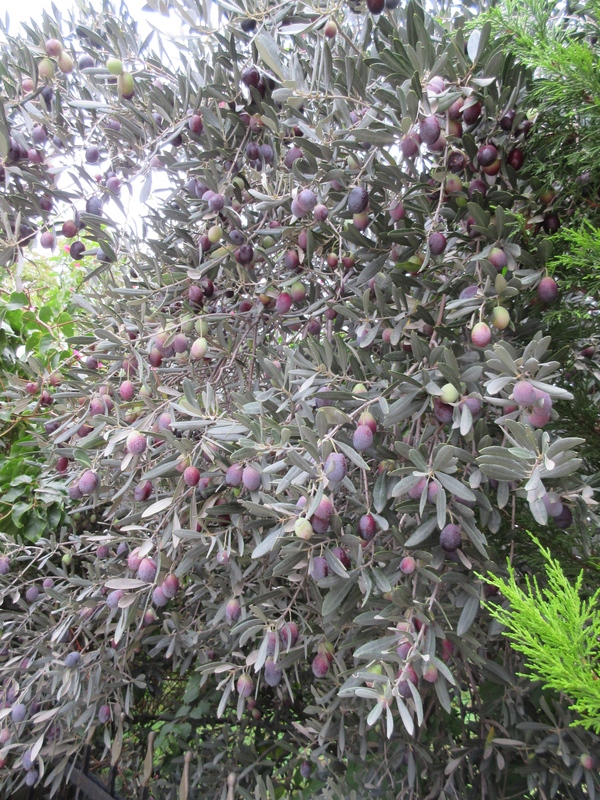 Olives are in season and heavy on the trees. 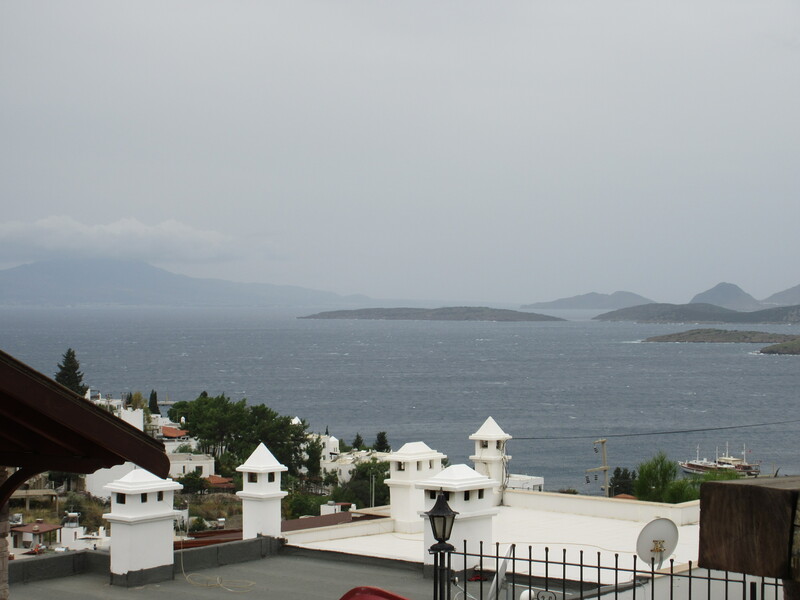 One of the rare stormy days we’ve had in Bodrum. 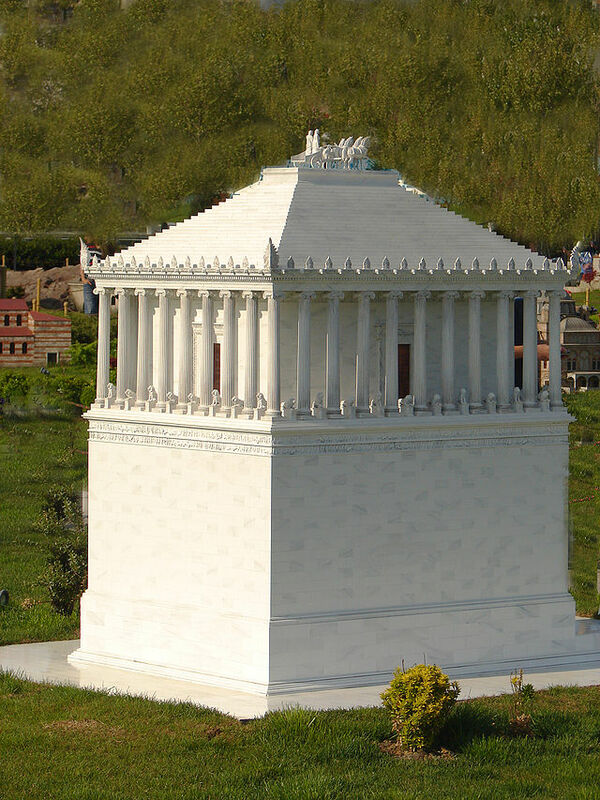 A scale model of what the Mausoleum probably looked like when it was built around 350BC. A wheel from the chariot on the roof was found; its diameter is over 6 feet. 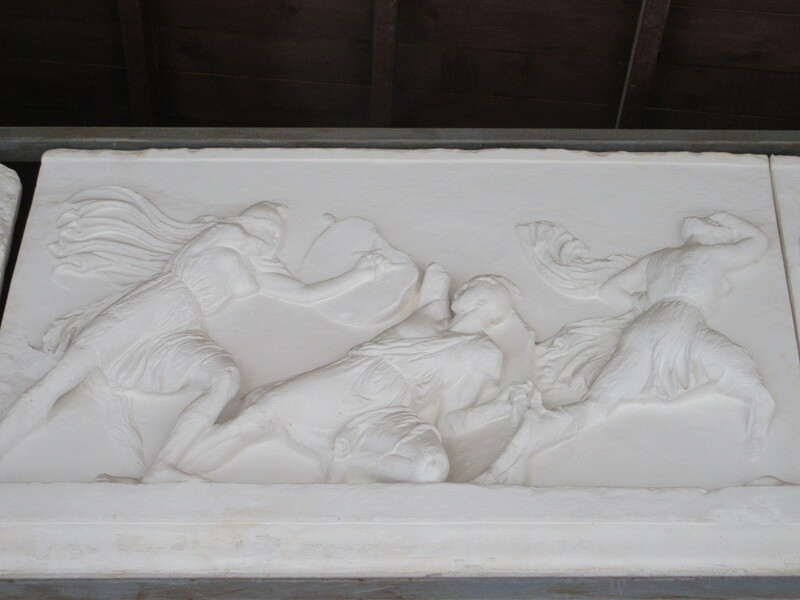 A carving from the Mausoleum shows Greeks fighting the Amazons. 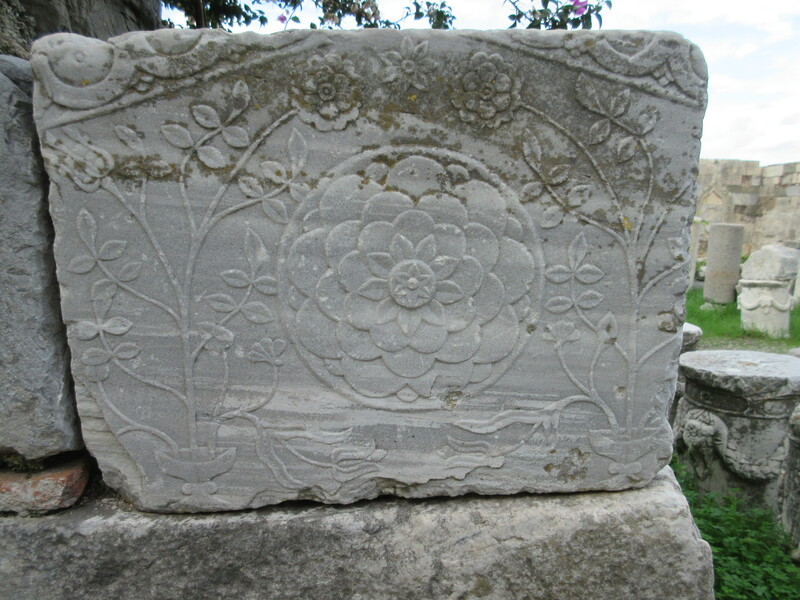 Burials tombs, like this one, existed in Bodrum before the Mausoleum was built.